I’ve been staying extra busy the past few months (apologies, blog readers!) with a new role at work, and that role took me to our Bay Area offices for a week. While it was a pretty packed schedule, I still fit in some quality meals. 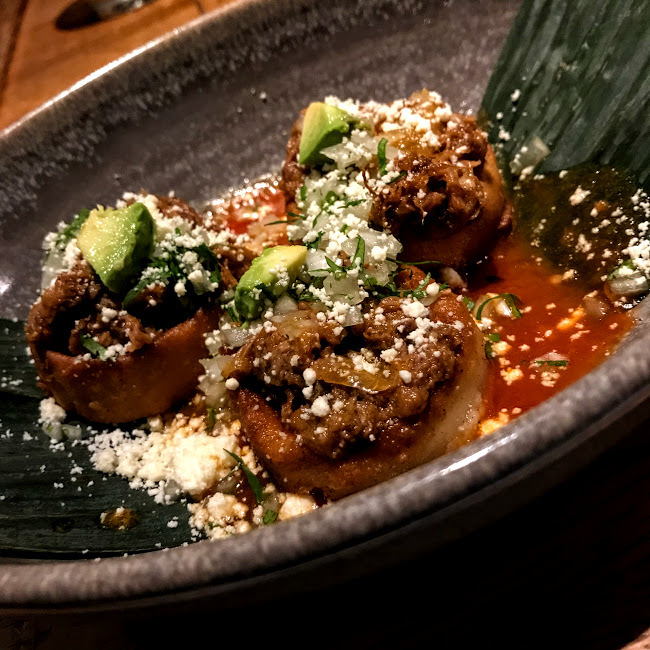 The night I arrived in San Francisco, I made a beeline for the Mission, a neighborhood that I knew from experience was great for dining. Foreign Cinema stood out for its sleek open-air dining space with string lights and a movie projected on the back wall. 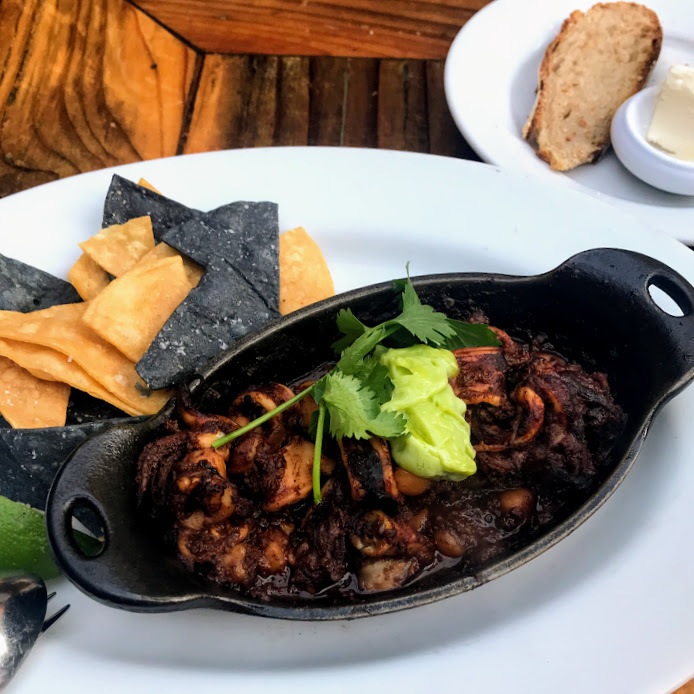 The food was also excellent – from a Catalonian noodle dish, brimming with four kinds of seafood and a buttery cumin sauce, to smoky, mole-slathered calamari with lime and tortilla chips. 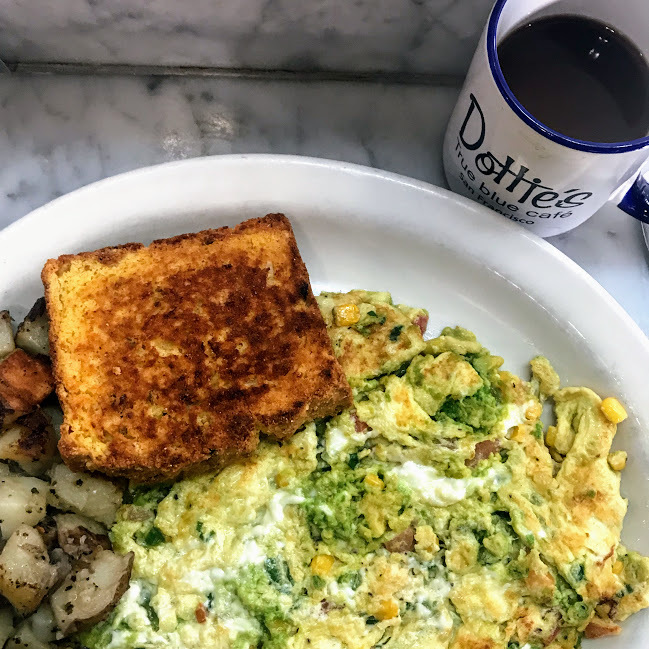 Dottie’s True Blue Cafe is a comfort food classic that had come highly recommended by friends, so I made sure to stop for brunch. I arrived just before it opened, and a line had already formed, as is typical, but the short wait was worth it. I went for the frittata special, a mammoth plate of eggs stuffed with some of my favorite ingredients (avocado, corn, feta), plus a side of crispy cornbread with pepper jelly. While I was far too full to try any of the bakery offerings during my visit, I managed to bring a small loaf of Dottie’s signature coffee cake back to Chicago (and was very glad I did). 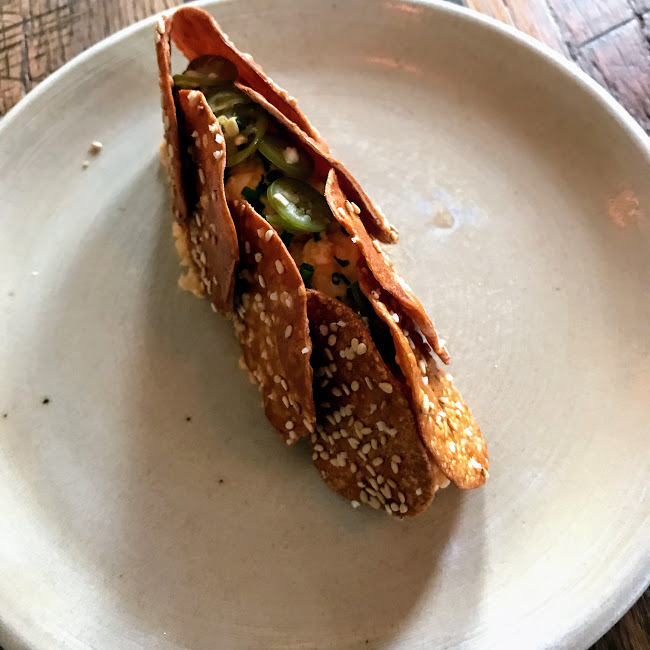 Another landmark I finally tried this trip was Mission Chinese Food, chef Danny Bowien’s trail-blazing take on Chinese cuisine that opened in the Mission nearly ten years ago, and now has locations elsewhere. Of the dishes I tried, the Westlake lamb dumplings stood out for their balance of tangy sauce, crispy wonton wrapper, and lots of fresh dill. 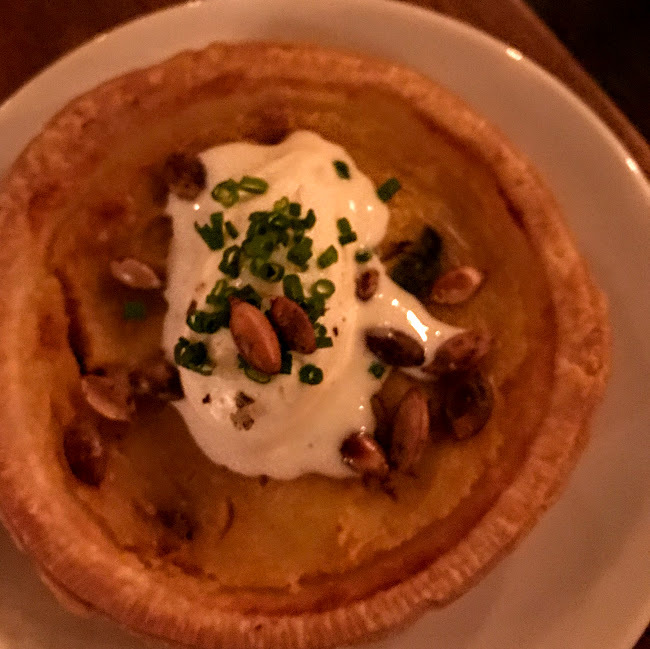 One unexpected dining success came at Hogwash, a craft-beer-and-sausage spot in Union Square. 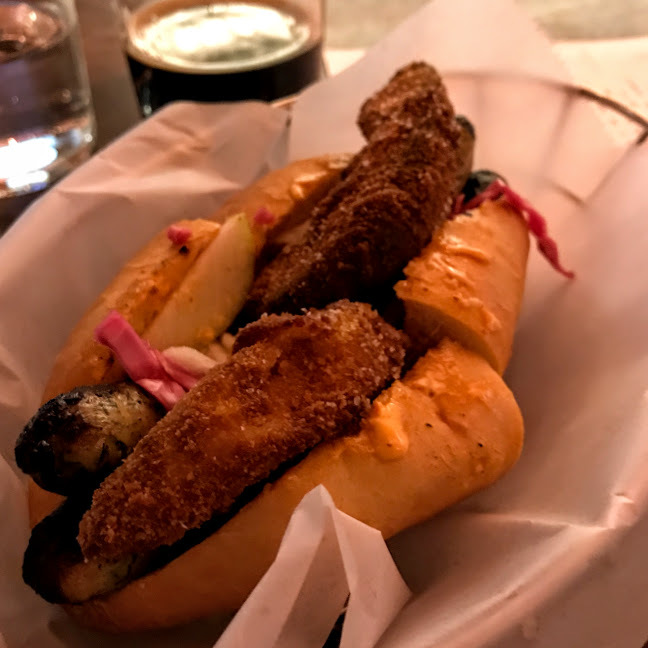 While I first chose the Burnin’ Brock sausage sandwich almost solely for its fried avocado, the rest of the spicy, crunchy flavors came together exceptionally well for one of the most satisfying bites of the trip. 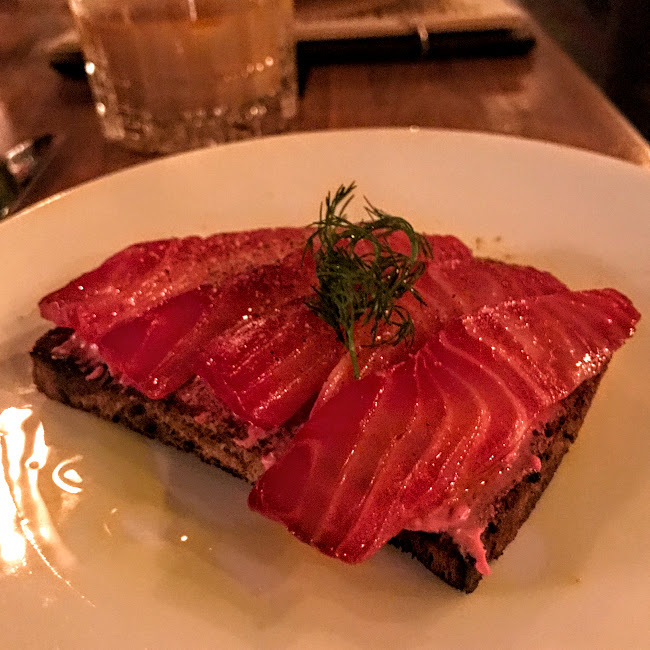 And I did still fit in a few sweet indulgences, starting with Tartine Manufactory, the recent restaurant offshoot of legendary Tartine Bakery. 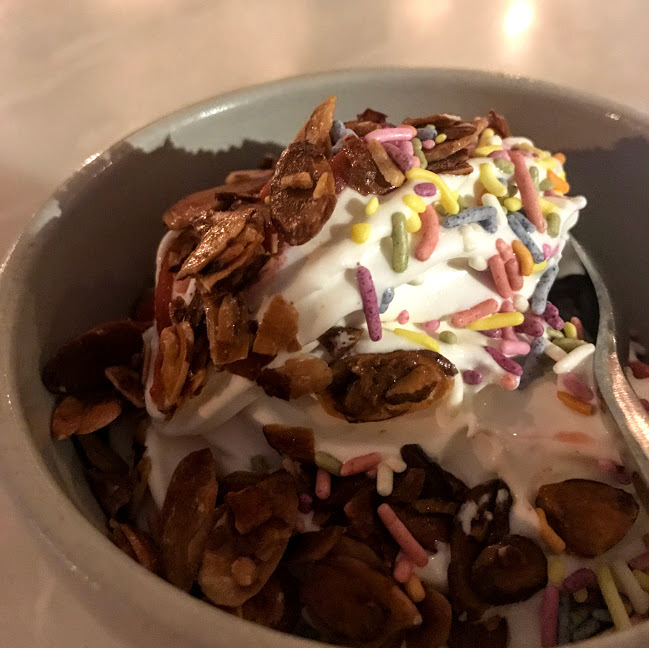 I went with a fairly simple sundae – strawberry and vanilla swirl soft-serve, colorful sprinkles, and candied almonds – but it was elevated just enough to feel special. 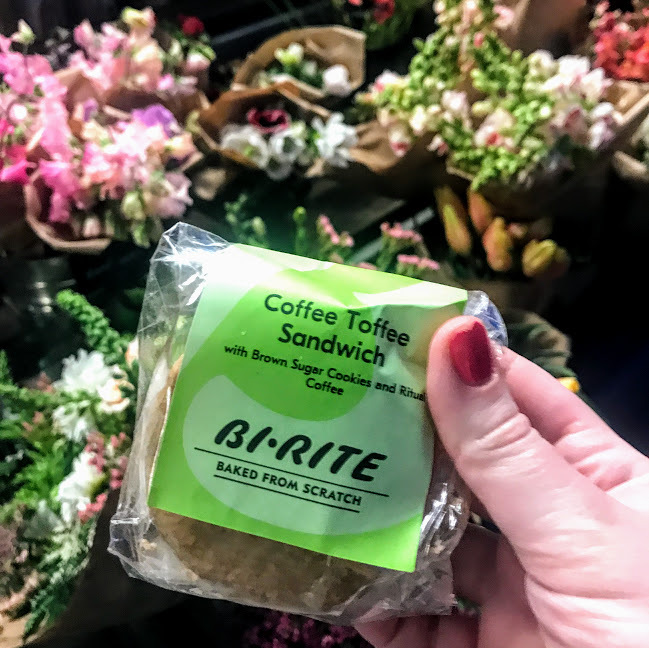 Bi-Rite, another favorite from past trips, has both a market and an ice cream shop on the same block. Rather than waiting in the long ice cream line, I picked up an ice cream sandwich (and a few other edible souvenirs) from the market. After a ride home to thaw, the rich coffee ice cream melted into the crumbly brown sugar cookies to the point that it might as well have been fresh from the shop. 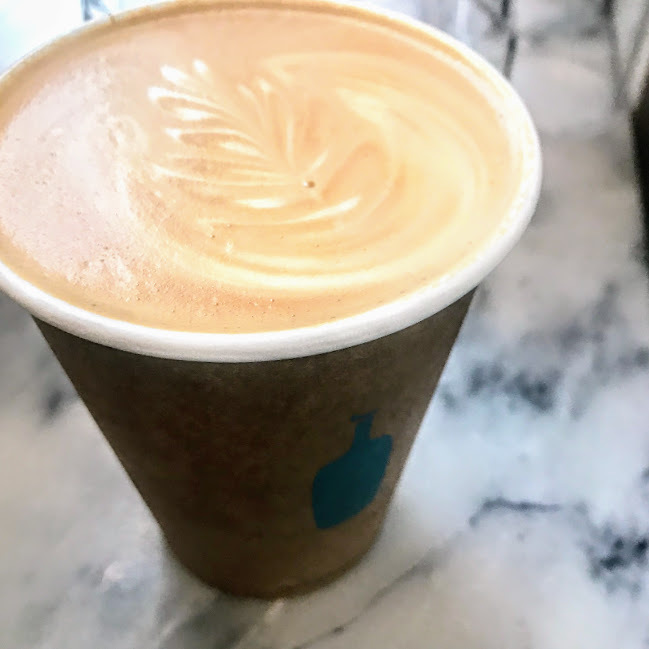 Speaking of coffee, there are a wealth of great roasters in San Francisco, but one of the stalwarts is Blue Bottle, so I felt very fortunate to have a shop within walking distance of my hotel. Their latte really is worth savoring. 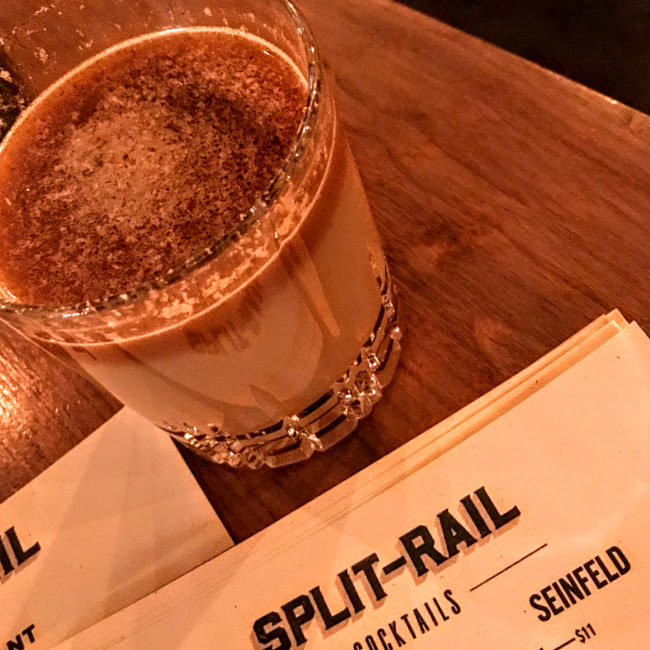 The details: Foreign Cinema, 2534 Mission St.; Dottie’s True Blue Cafe, 28 6th St.; Mission Chinese Food, 2234 Mission St.; Hogwash, 582 Sutter; Tartine Manufactory, 595 Alabama St.; Bi-Rite Market, 3639 18th St.; Blue Bottle Coffee, 66 Mint St.; all San Francisco, California. Heaven on Seven has been one of my Chicago dining blind spots: a classic that I’ve somehow never managed to visit. 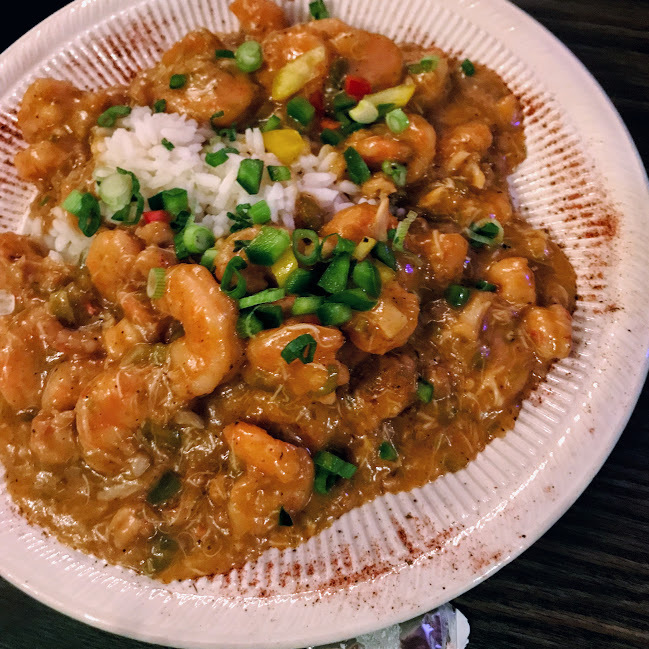 It’s a boisterous Cajun restaurant tucked away on the seventh floor of a Loop high-rise (you even have to sign-in with a charming doorman before getting on the elevator). 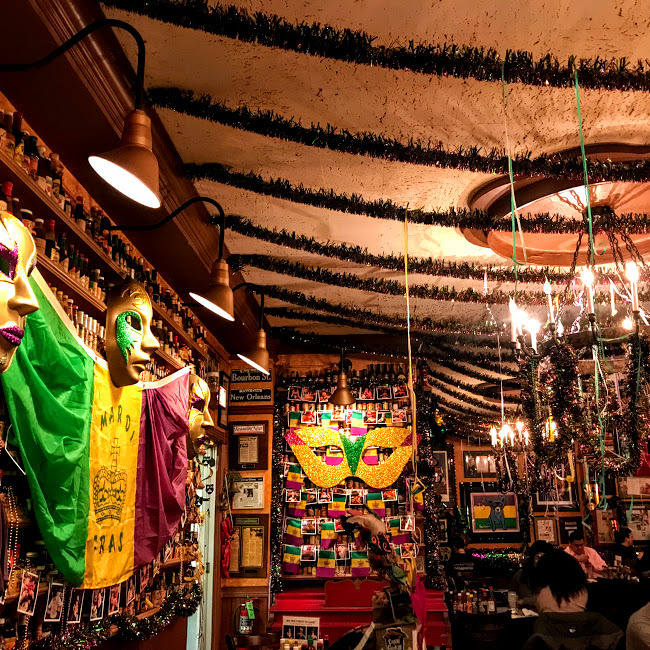 We visited the week of Fat Tuesday, so Mardi Gras decorations were in high gear and we were both given a string of beads upon arrival, but I have a feeling it still feels like a party all year around. One of the many specials was a bayou étoufée with three kinds of seafood: crab, crawfish, and shrimp. The trio was a great sampling of shellfish flavor, stewed together in a rich gravy and served over rice. 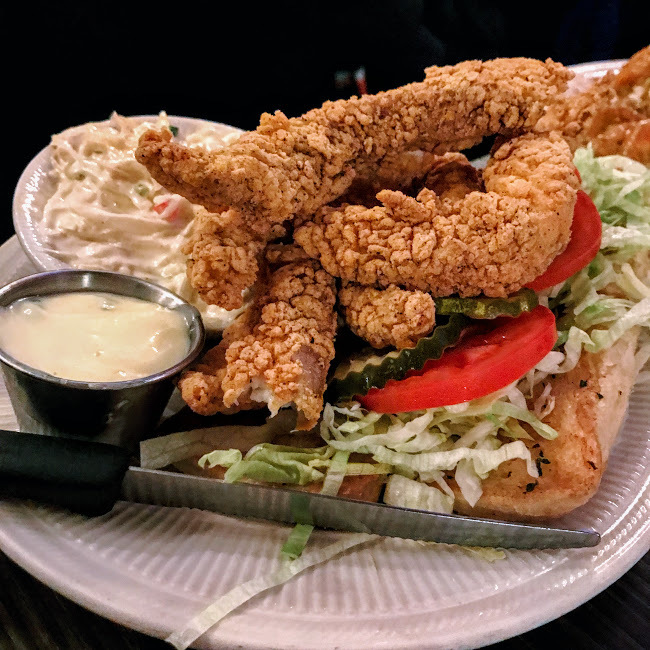 We also shared the catfish po’boy, a mammoth sandwich loaded with catfish, lettuce, tomato, pickles, and honey-jalapeño dressing. What really made it was the way the bread was toasted with butter and herbs. 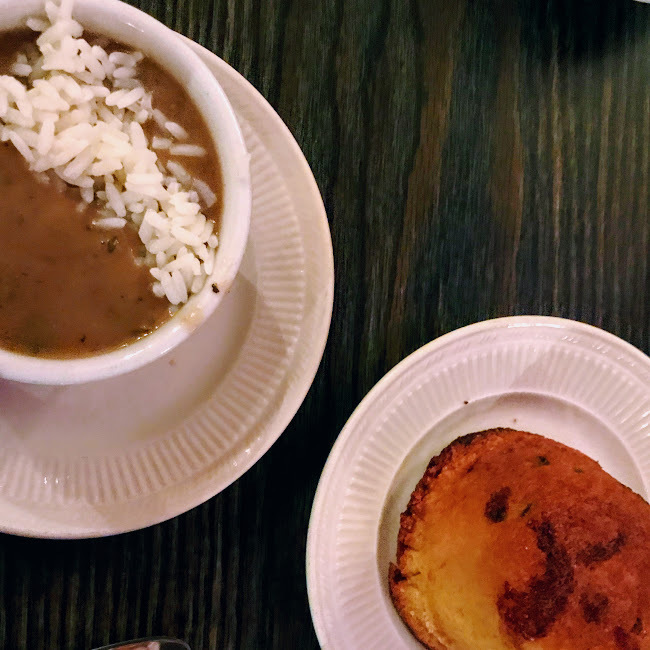 All entrees come with gumbo, soup, or salad, but it’s easy to see why pretty much everyone gets the gumbo. 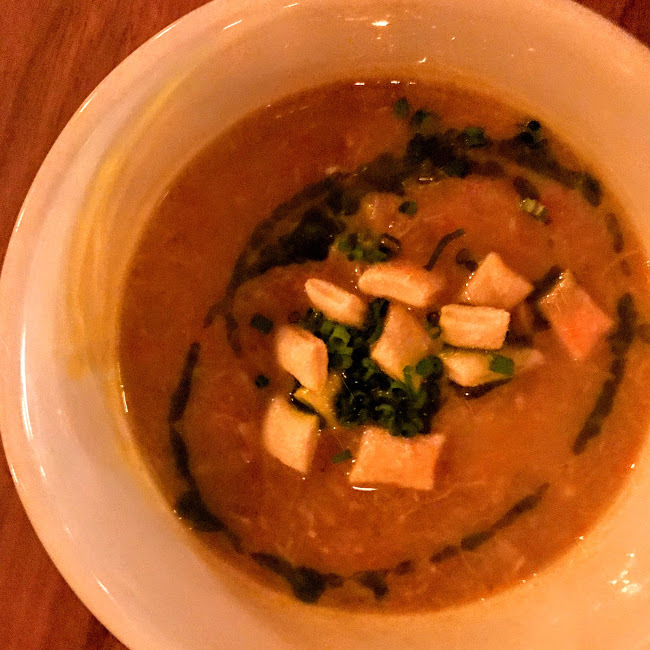 Chicken, andouille sausage, and the smoky depth of a black roux came together for a thick and satisfying soup – with a warm jalapeño corn muffin to round it out with sweetness. The details: Heaven on Seven, 111 N. Wabash, Chicago. 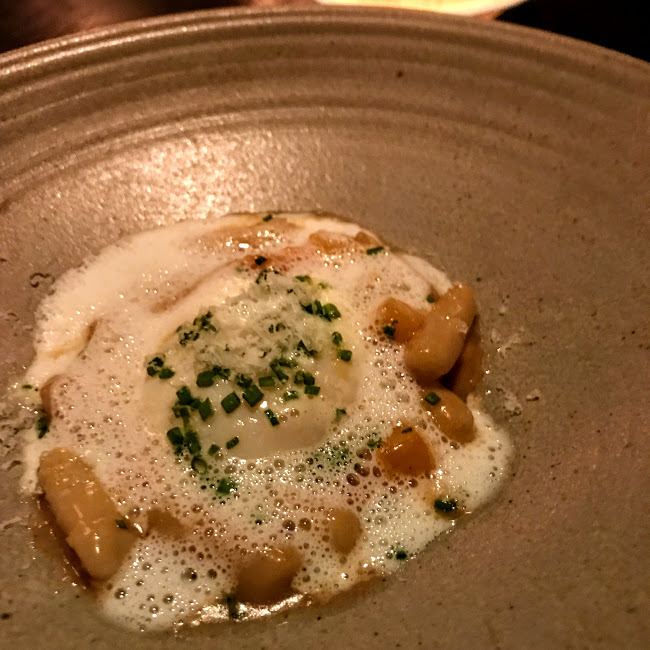 Like last year, I’ve chosen 20 more Chicago dishes and drinks – some old favorites, some new discoveries – that I didn’t have the chance to blog about in 2017. View year-end recaps from 2012, 2013, 2014, 2015, and 2016. 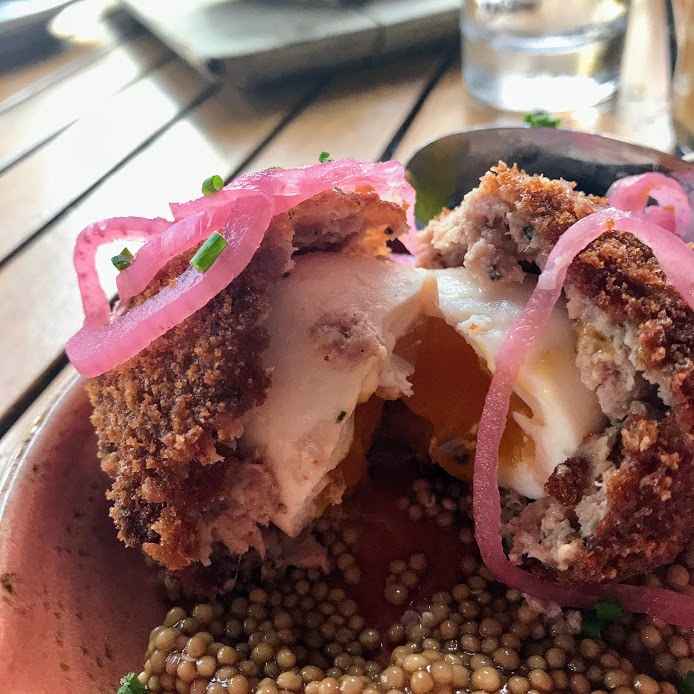 We ordered this appetizer almost as an afterthought, but all the textures – tiny pickled mustard seeds, crunchy battered sausage, and a perfectly runny egg – made it memorable. It was even better accompanied by live blues performers on the riverside patio on a warm September day. 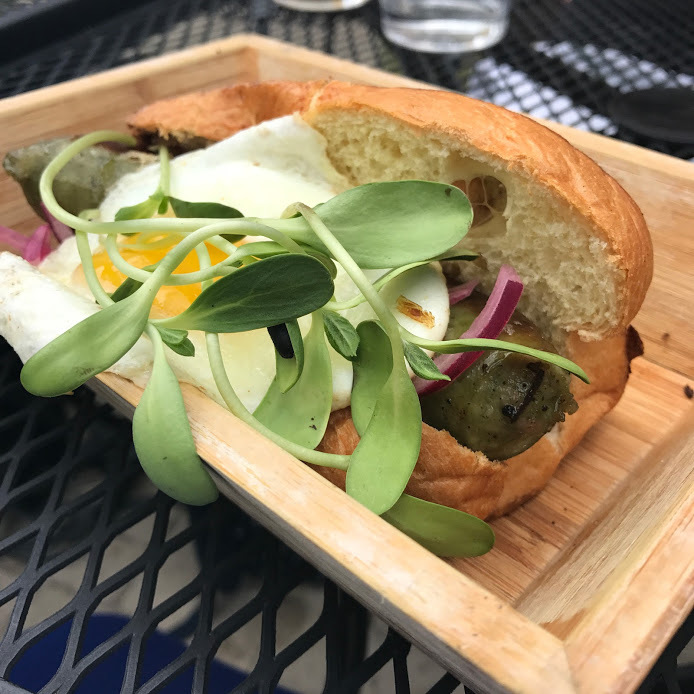 The chorizo verde is now a mainstay of Quiote’s dinner menu, but over the summer it showed up as an egg-topped breakfast sausage. The meat itself was so flavorful that I could have easily eaten it on its own, but having it safely ensconced in a soft lobster roll made it more delicious. 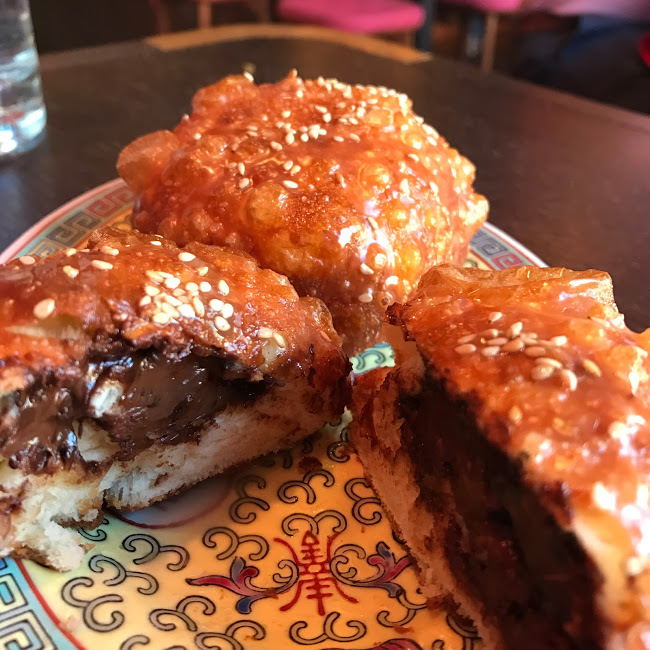 At the end of a dim sum feast at Stephanie Izard’s Chinese eatery, we couldn’t help but order this donut-bao hybrid. The crackly, not-too-sweet topping gave way to rich chocolate filling; I did not regret ordering it. 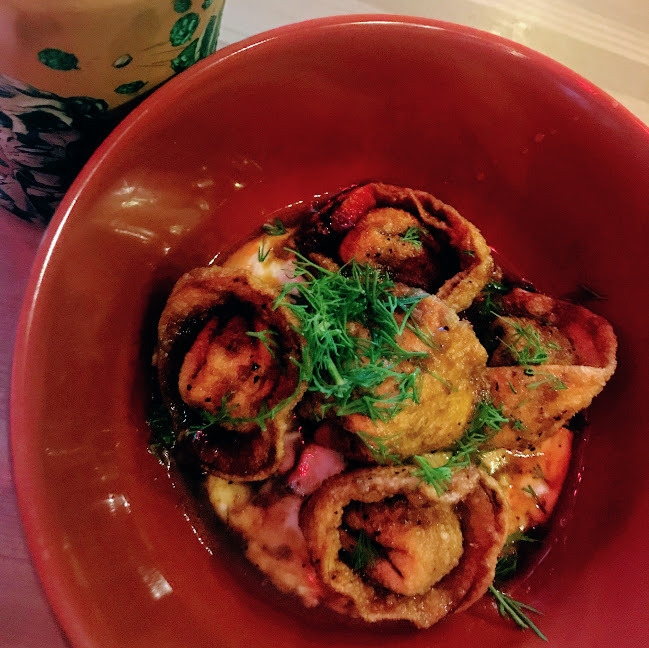 Left Coast’s menu is brimming with healthy, veggie-centric options, but I’ve stuck with this curry bowl every time. 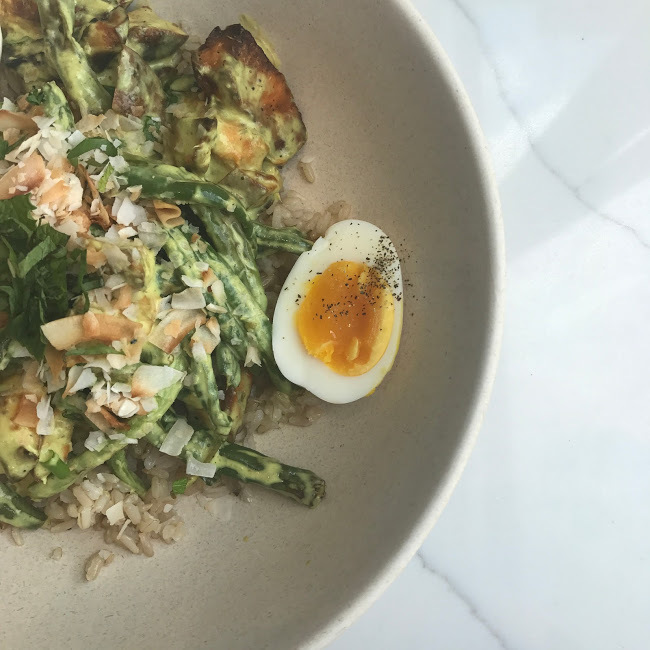 From the green beans and yams all the way to the toasted coconut, every component comes together well. 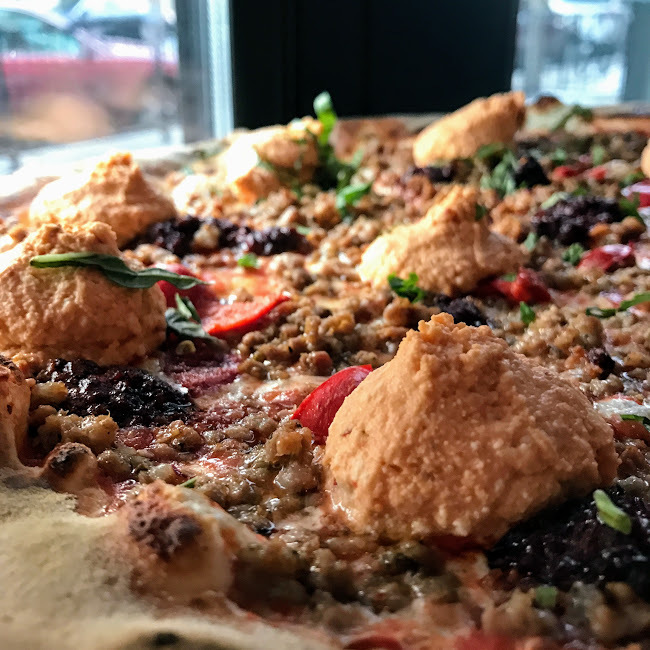 If anyone mentions Coalfire, ‘nduja (a spicy, spreadable sausage) is the first pizza I recommend (and so does most of the Chicago food media). Sausage comes in two forms: one is sliced thin, and the other is whipped into the ricotta mounds. Fresh from the coal-burning oven, it’s pretty much a foolproof pick. 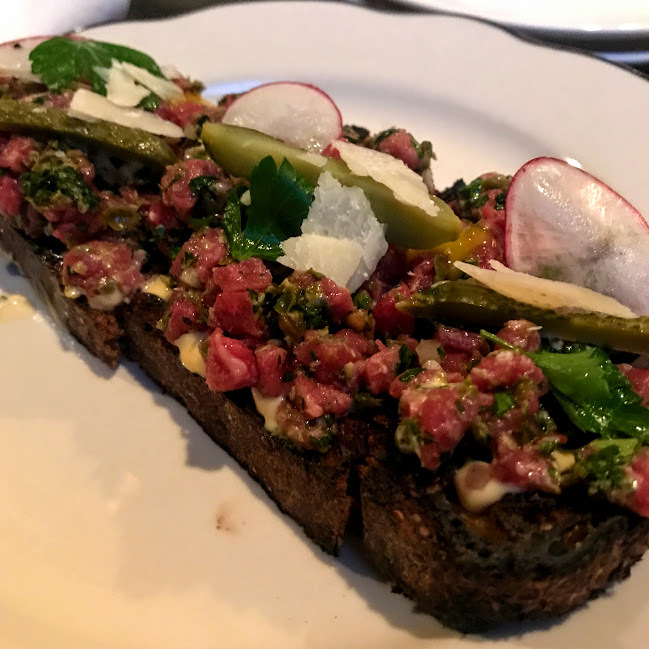 Hopleaf in Andersonville is world-renowned for its encyclopedic beer list, but they definitely don’t cut corners on the food. 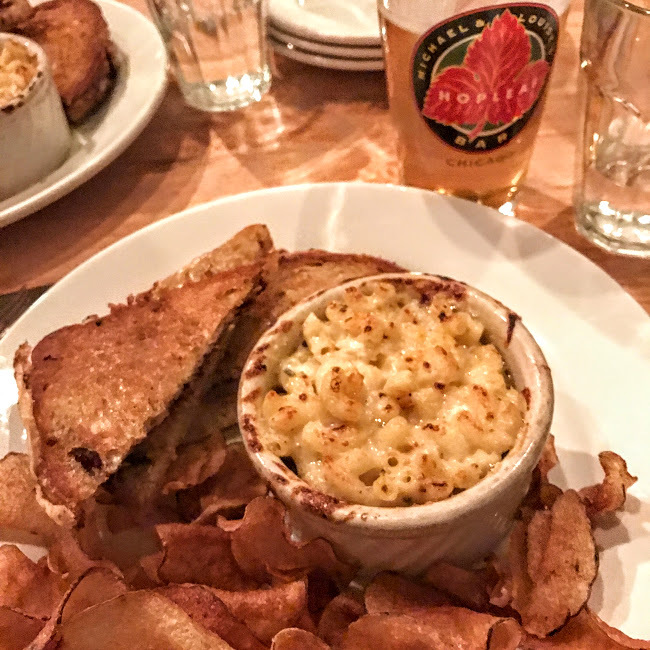 The CB&J is an especially comprehensive pairing, with three kinds of comfort in one dish: a cross between grilled cheese and PB&J (raclette cheese in addition to cashew butter and fig jam), crunchy chips, and mac & cheese (made cheffier with Stilton). I’d trust it to soak up any brew. You know it’s really spring when ramps start appearing on every menu, and Butcher & the Burger was no exception. I’m usually overwhelmed by all their options, so ordering this special was a no-brainer. It was a winning combination of truffle-pesto-onion goodness. 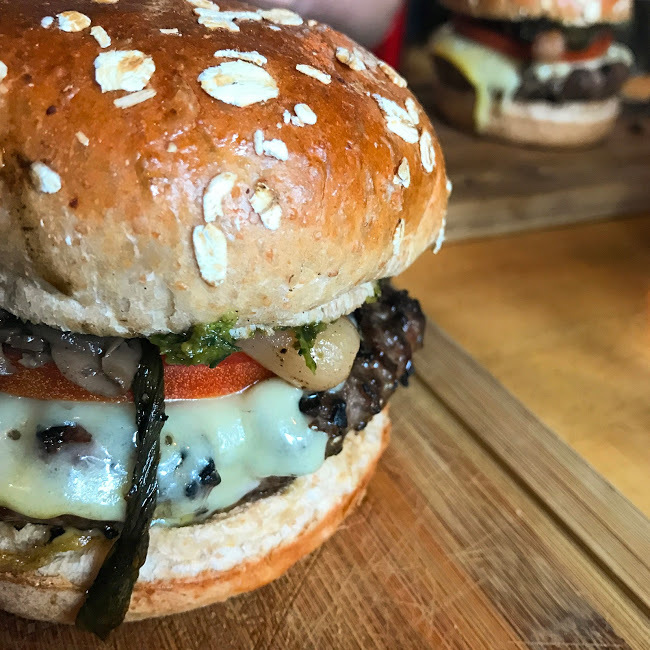 Small Cheval keeps it simple with a slightly more portable version of the famous Au Cheval burger, complete with griddled patties, American cheese, and house-made pickled. I also added fernet to my chocolate shake for an extra licorice-y kick. 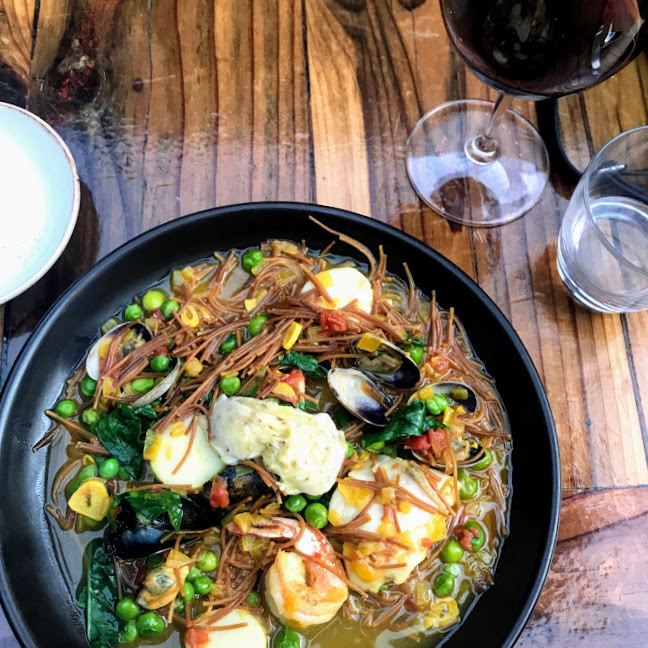 We snacked at seafood bar Cold Storage as a prelude to dinner at adjacent Swift & Sons, and this dish was a perfect pairing with our oysters. 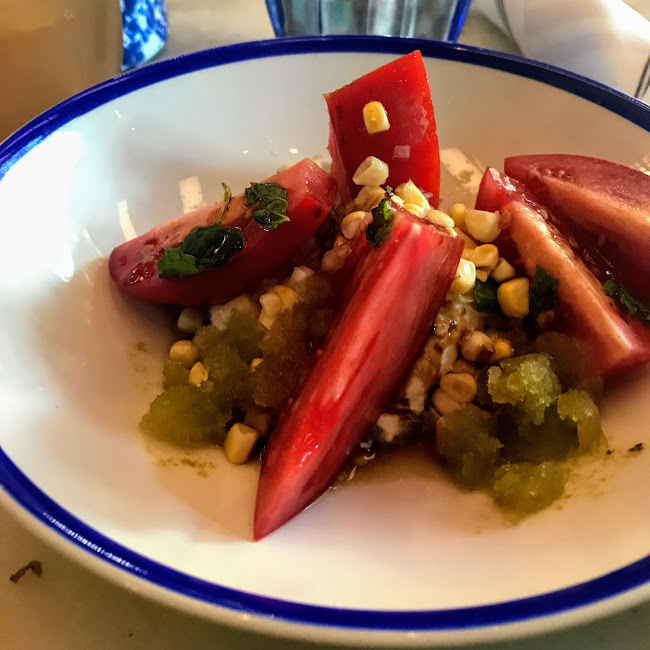 The sweet corn and cool lime granita set off the juicy tomato and soft burrata beautifully. 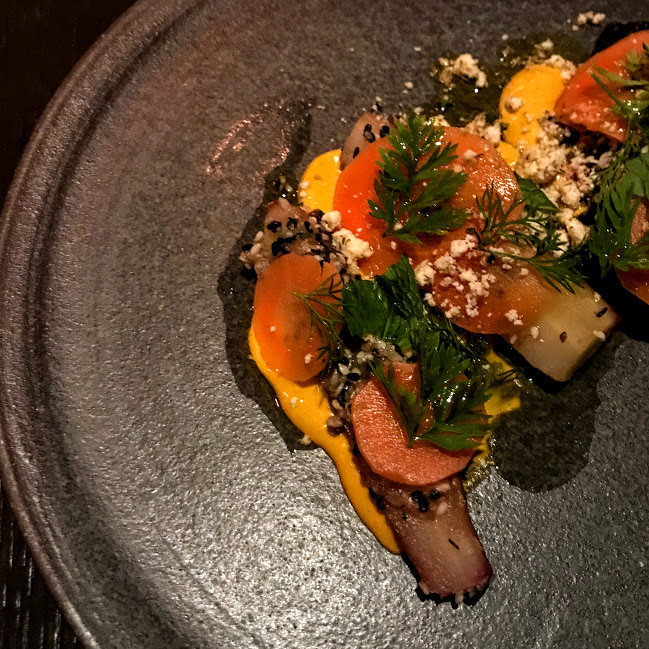 My rule when dining at Girl & the Goat is to always order one goat dish (and one bread, and at least one from each of the standard menu sections…but that’s another story). 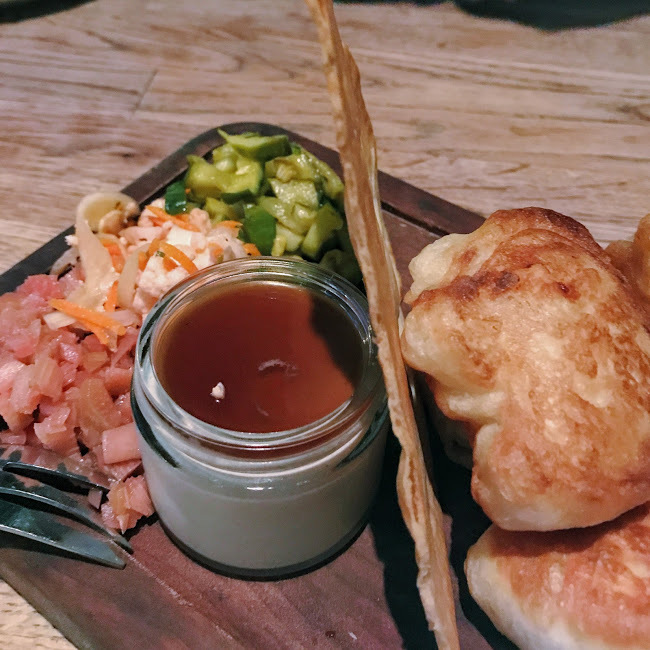 The mousse was almost mesmerizing in its silkiness atop warm crumpets, with a nice variety of pickled vegetables as palate cleansers. 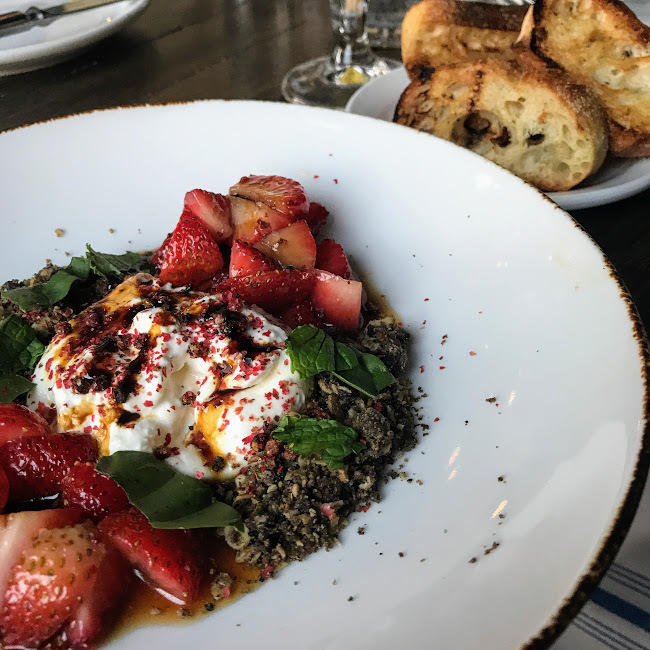 Along with the strawberry-and-pistachio-studded burrata dish at the top of this post, this popcorn stole the show at West Town brewery Forbidden Root. 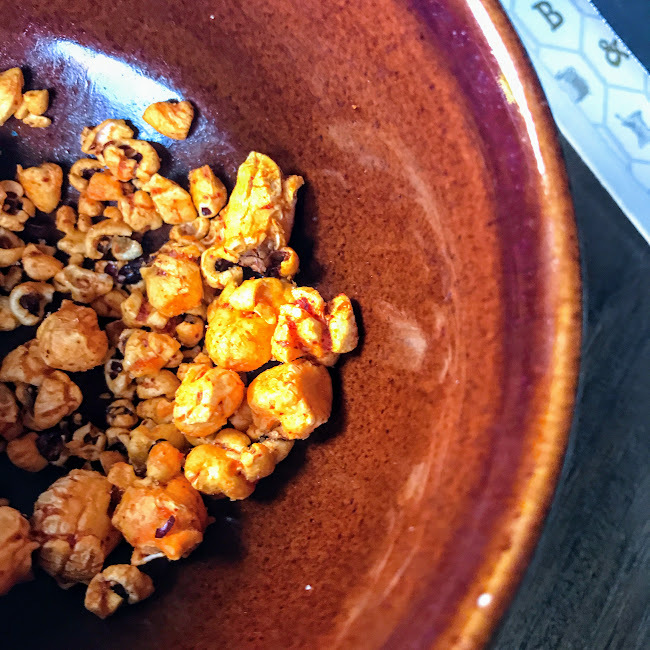 Maybe it was the coconut oil, maybe it was the specific type of chiles (the same ones as the Korean hot sauce that’s used in bibimbap and other dishes); either way, this popcorn was outrageously good. The second-floor terrace of Brickhouse Tavern overlooks Park at Wrigley (the new development next to Wrigley Field), so it was the perfect perch after a July Cubs game. 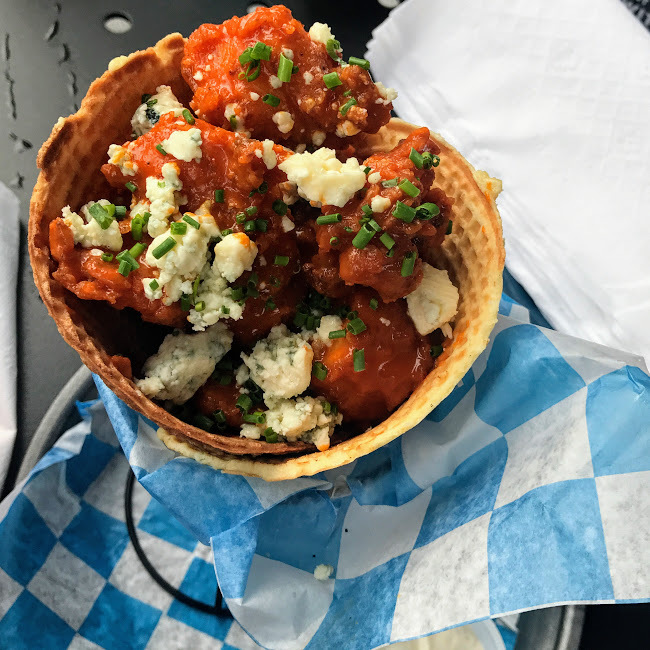 This was the most creative (and successful) buffalo chicken format I’ve seen yet. 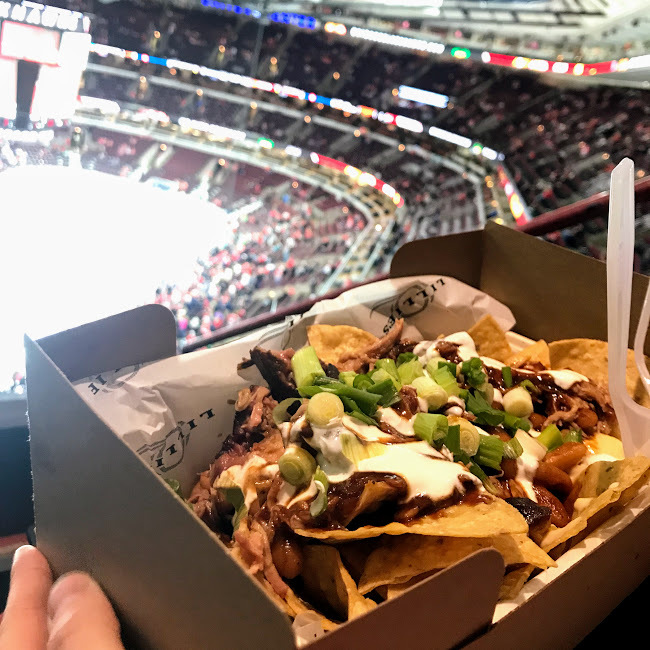 Most of Chicago’s stadium food has been getting an upgrade in recent years, and I was especially pleased to find a Lillie’s Q outpost at a recent Blackhawks game. The pulled pork nachos put those standard cheese cups to shame, with plenty of pulled pork, sauce, green onions, and even BBQ beans. Boleo occupies a colorful rooftop space on the 15th floor of the Kimpton Gray hotel. 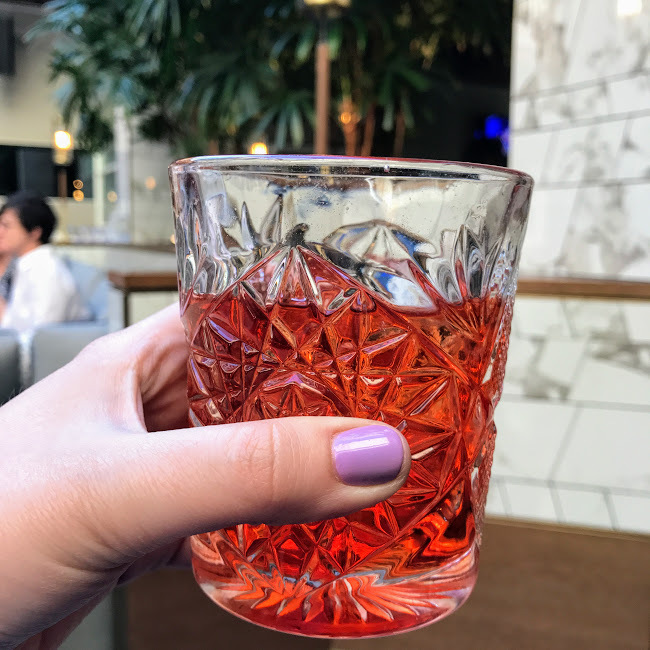 This subtly coconut negroni was an ideal sipper as I gazed at blue sky and tall buildings (and wished I could take home the gorgeous glass). 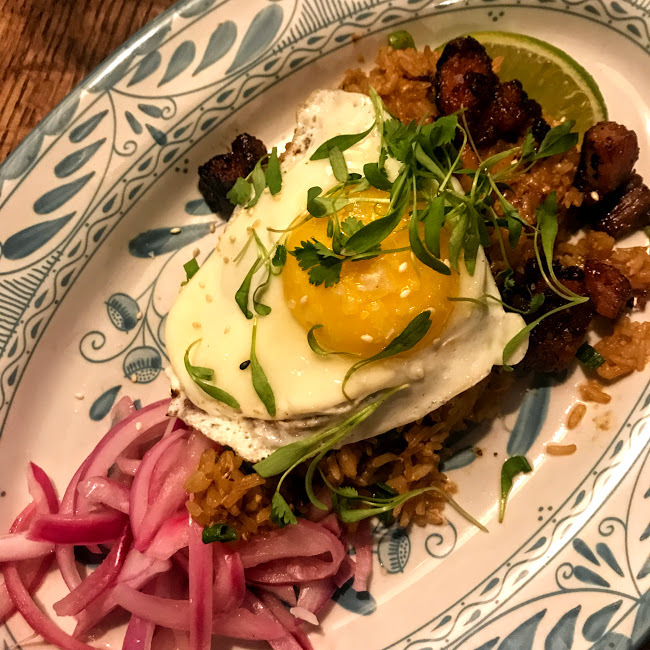 Mahalo is the closest you can come to a Hawaiian escape without leaving Wicker Park. 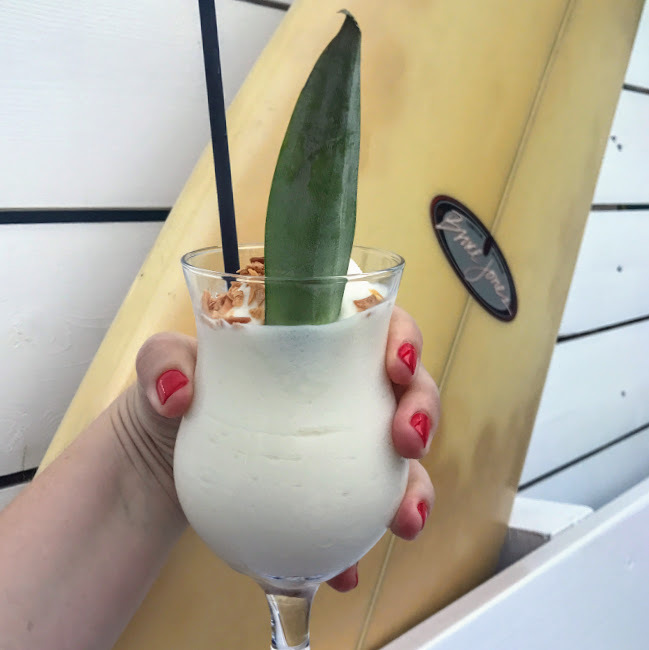 This piña colada was a refreshing treat on the surfboard-adorned rooftop. 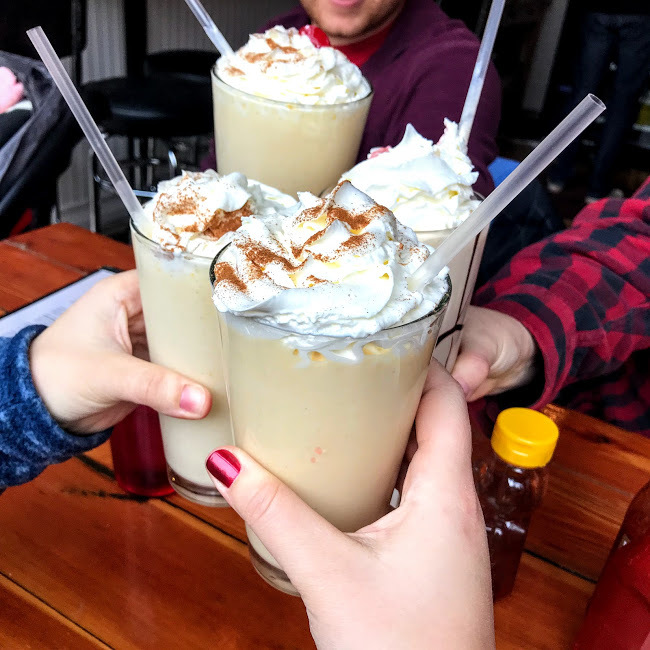 As much as we love the fried chicken at The Roost (a very popular catering pop-up at the office), our group may have come to brunch at the Irving Park Road location primarily for this shake. I’ve had the peach cobbler as a side before, but it really is dreamy when whirled into vanilla ice cream and spiked with rum. Beatnik was the most Instagrammable restaurant interior of 2017, with its bold fabrics and exquisite chandeliers. Food-wise, while we expected all the globally inspired cocktails and snacks to be on point, this dessert was what shocked our entire party. The cake itself was delicate and citrus-y, and the shredded phyllo worked even better than a crust. Anything PB&J is a winner in my book, so I was thrilled to see this pie special. The potato chips were a nice final touch on an already nostalgic slice. 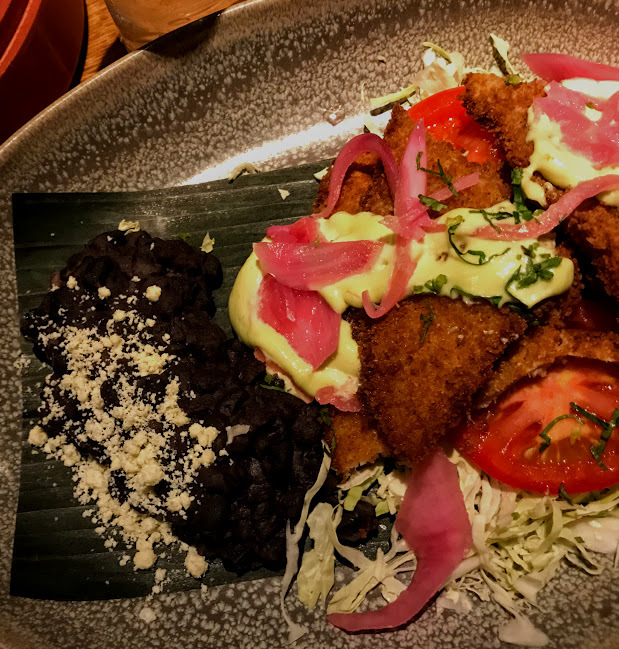 River North newcomer Barrio also opened a neighboring upscale bodega that specializes in fancy churros. 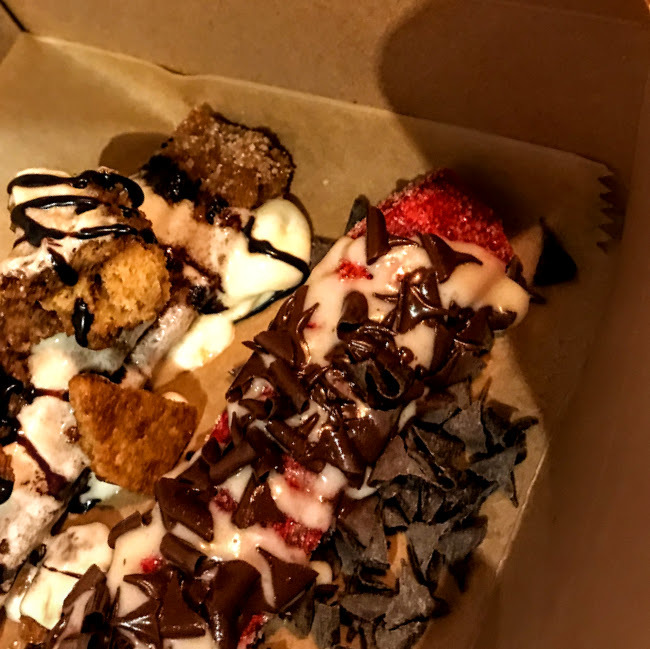 I chose the red velvet and s’mores varieties, both warmed and drizzled in chocolate, and let’s just say there will be more churro stops in my future. 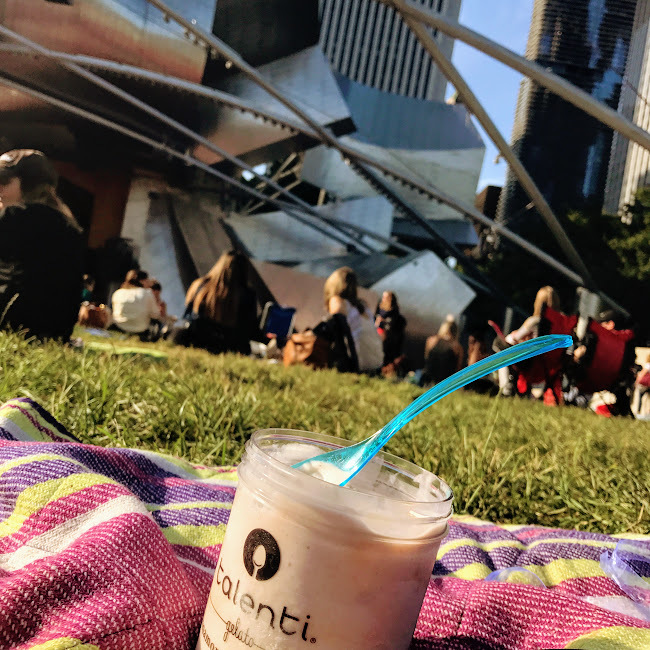 Talenti ran a free gelato promotion at three movie nights in Millennium Park this summer, and (somewhat coincidentally) those were the three I attended. This flavor ended up in my hands the first time, and I sought it out thereafter because the cinnamon and peach were so perfect for summer. And the price of $0 made it especially satisfying! Thanks for reading in 2017, and looking forward to another delicious year! 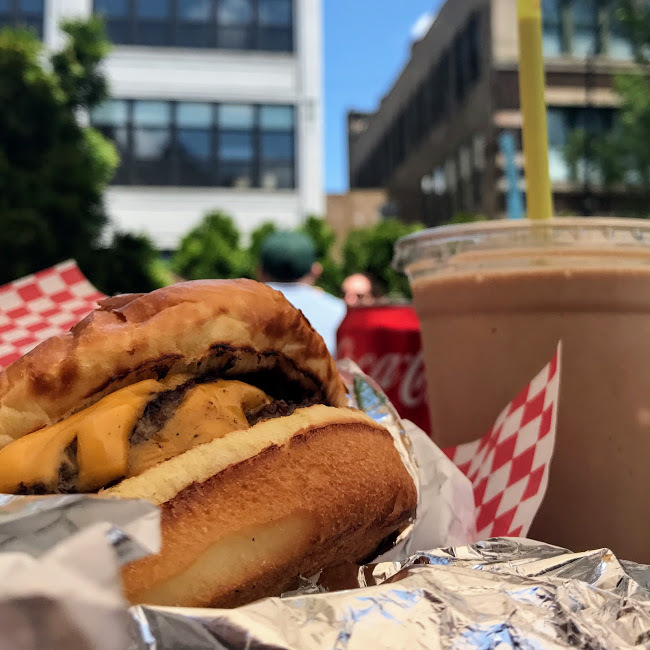 The details: River Roast, 315 N. LaSalle St.; Quiote, 2456 N. California Ave.; Duck Duck Goat, 857 W. Fulton Market; Left Coast, 717 N. Wells; Coalfire, 3707 N. Southport Ave.; Butcher & the Burger, 1021 W. Armitage Ave.; Hopleaf, 5148 N. Clark St.; Small Cheval, 1732 N. Milwaukee Ave.; Girl & the Goat, 809 W. Randolph St.; Cold Storage, 1000 W. Fulton Market; Forbidden Root, 1746 W. Chicago Ave.; Brickhouse Tavern, 3647 N. Clark St.; Lillie’s Q (300-Level) at United Center (Sections 206 and 330), 1901 W. Madison St.; Boleo, 122 W. Monroe St.; Mahalo, 1501 N. Milwaukee Ave.; The Roost, 1467 W. Irving Park Rd. ; Beatnik, 1604 W. Chicago Ave.; Bang Bang Pie Shop, 2051 N. California Ave.; La Bodega at Barrio, 65 W. Kinzie St.; all Chicago. In the fall, I spent a long weekend in Nashville with a girlfriend. 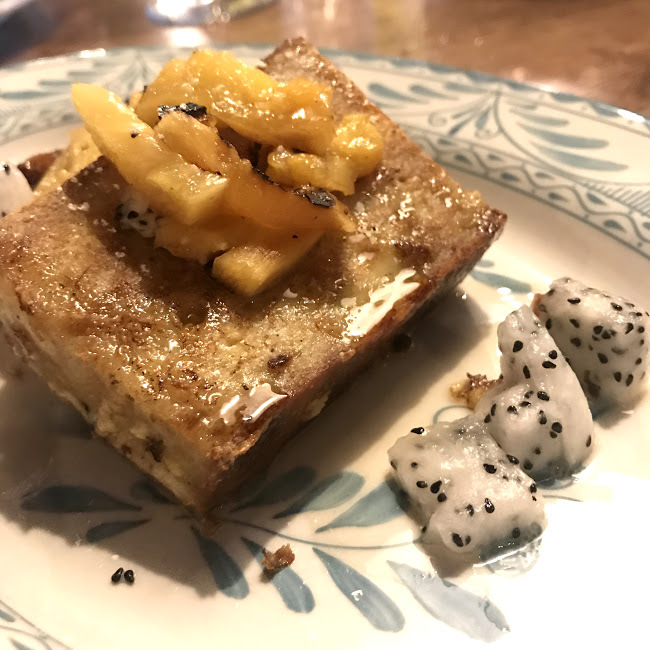 We were there to celebrate another friend’s wedding – which had incredible culinary offerings of its own, I might add – but also managed to sample a lot of other local offerings. 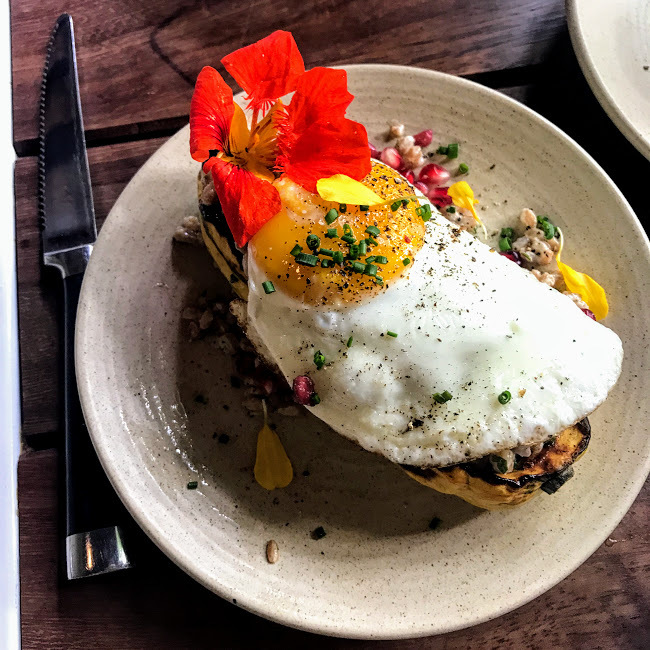 I have to begin with Butcher & Bee, where their brunch menu was possibly the most enticing and creative one I saw all year. 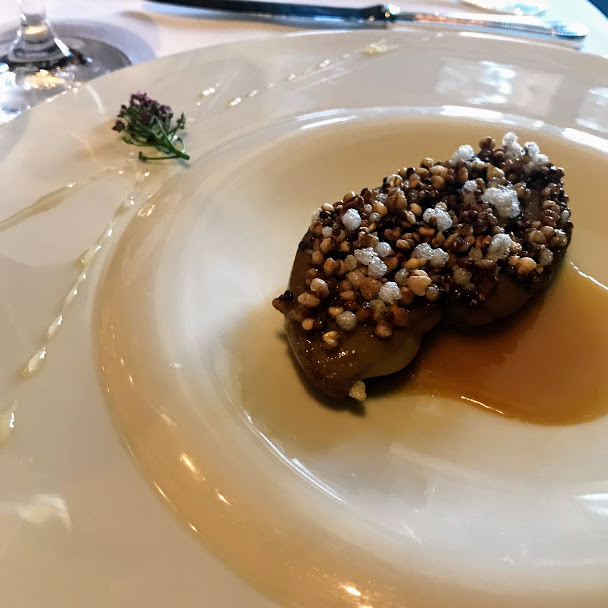 I absolutely couldn’t get over the whipped feta appetizer, with a pool of fermented honey and a healthy dusting of black pepper. 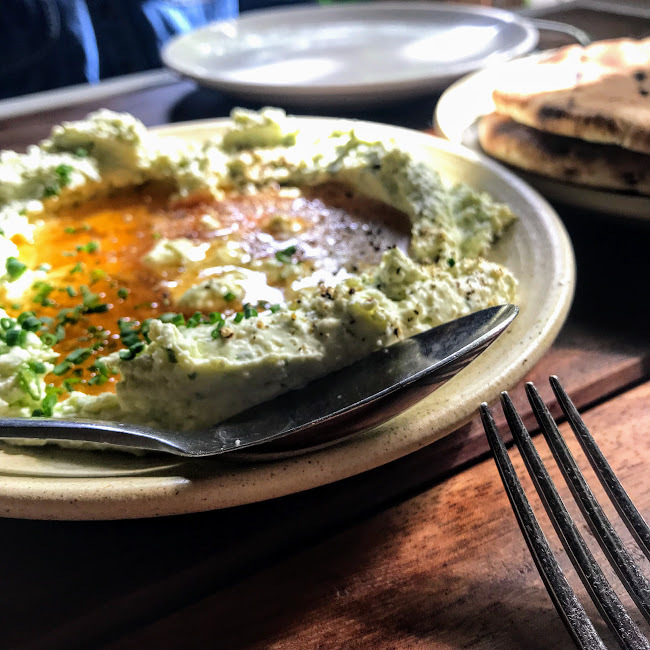 It was deceptively simple at first glance, but the feta spread was so outrageously good with the blistered pita bread that I’m sure I’ll be recalling it for years to come. I was also impressed by the most beautiful presentation of delicata squash I’ve seen at any meal, much less brunch. From the lacy fried egg to nutty farro to juicy pomegranate seeds, it was a lovely, still-light dish. 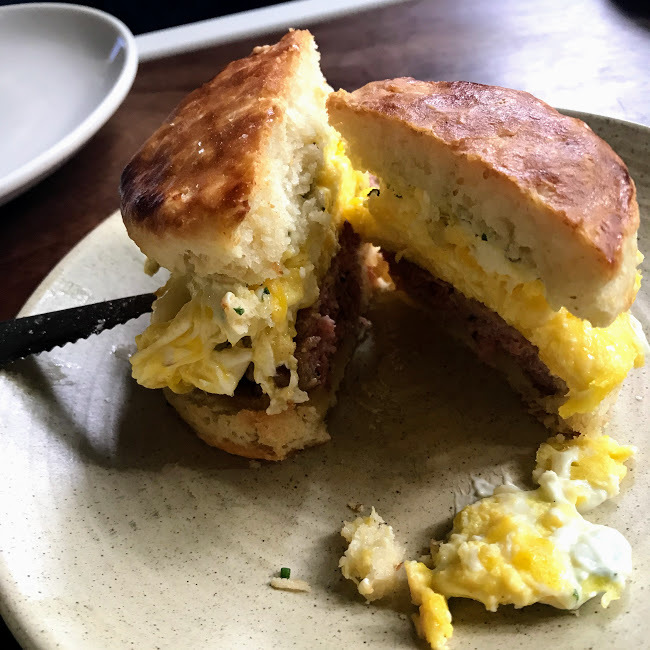 For balance, the breakfast sandwich biscuit put us back into richer territory. A fluffy biscuit was slathered with more whipped feta (! ), plus egg and maple-sage sausage. It was a classic done very well. And because I had loved Husk so much while visiting Charleston four years ago, I knew I had to check out the Nashville location. I first made sure we ordered the pimento cheese in some form, as chef Sean Brock is known for it. Here, it was hidden underneath a tunnel of seedy crackers, but still as good as I’d remembered. My favorite dish, though, turned out to be the crab rice. 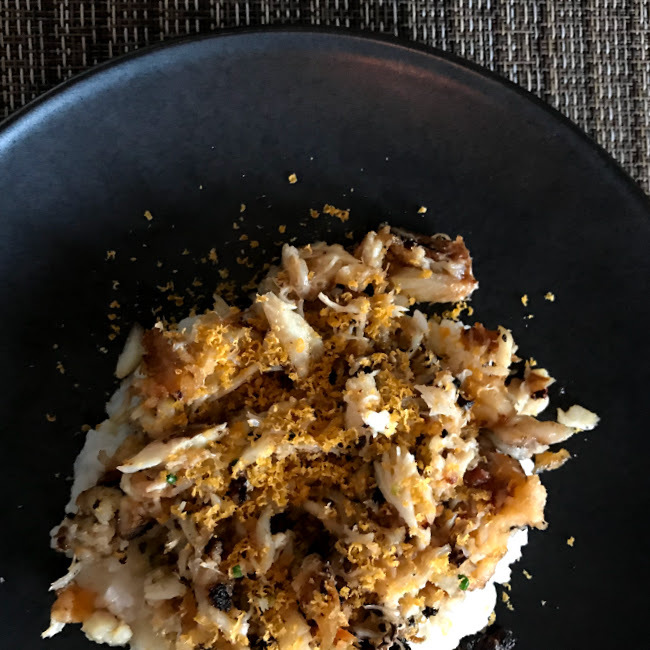 Amidst so many different textures, the buttery crab flavor still shone through in the best way. 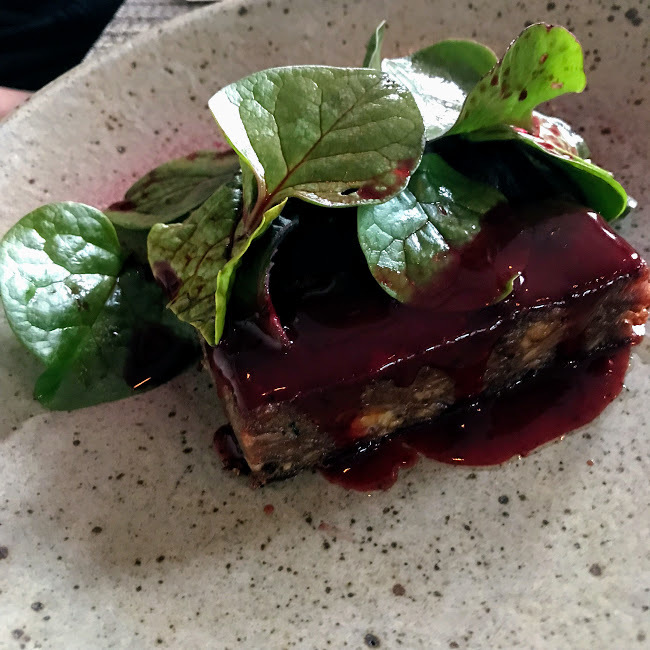 Another highlight was the duck confit and its ash-buried beets (it sounds strange, but worked). 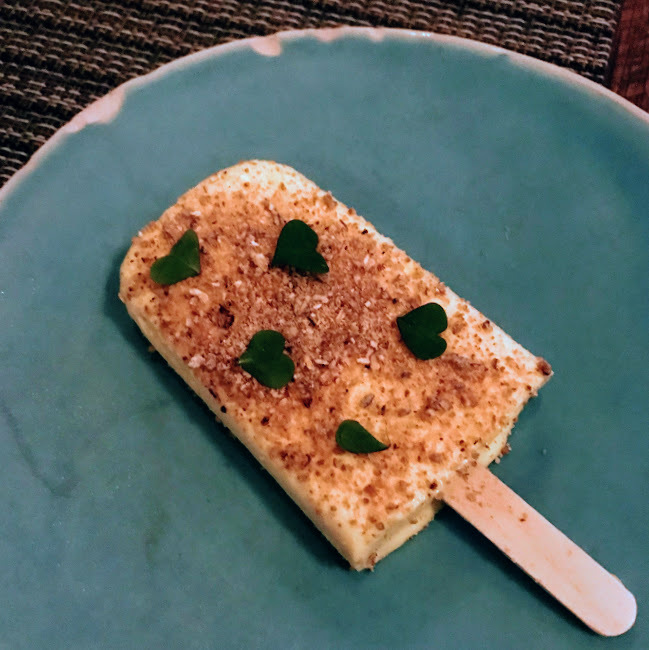 And for dessert, we had the most adorable popsicle, almost like a Creamsicle but with melon and a hint of crunch. Nashville is also known for the classic meat-and-three (a meat main course with three side dishes). For that, we went straight to Arnold’s, the top recommendation from a coworker who grew up in the area. 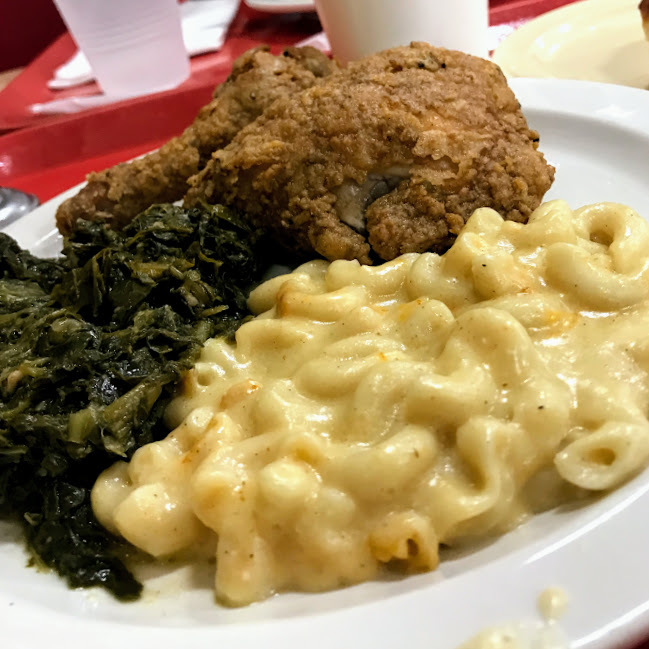 We arrived right at opening, to avoid the long lunchtime lines, and weren’t disappointed by the extra-fresh-and-crispy fried chicken, creamy mac-n-cheese, and vinegary greens. 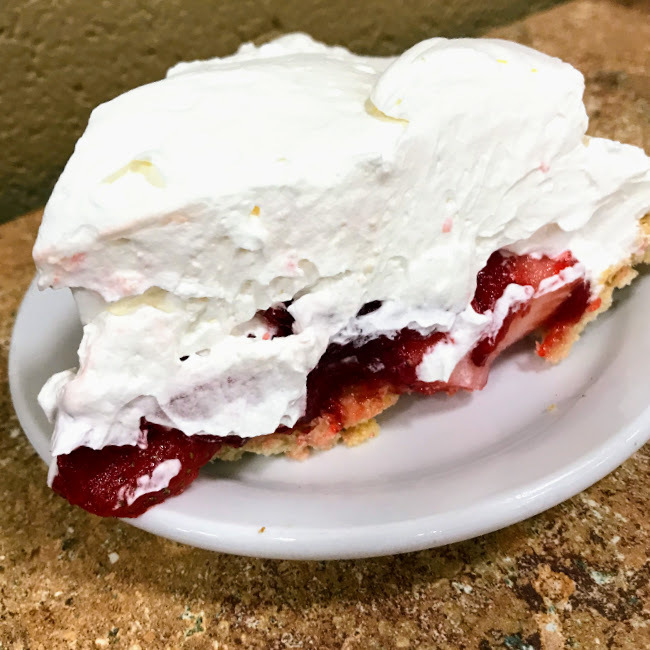 And I couldn’t pass up a comforting slice of strawberry pie with a mile-high blanket of whipped cream on top. Since we were staying in East Nashville, it was convenient to explore the up-and-coming food scene there. We happened upon Five Daughters Bakery, and saw that their version of a cronut (croissant-donut hybrid) claimed to have 100 layers. 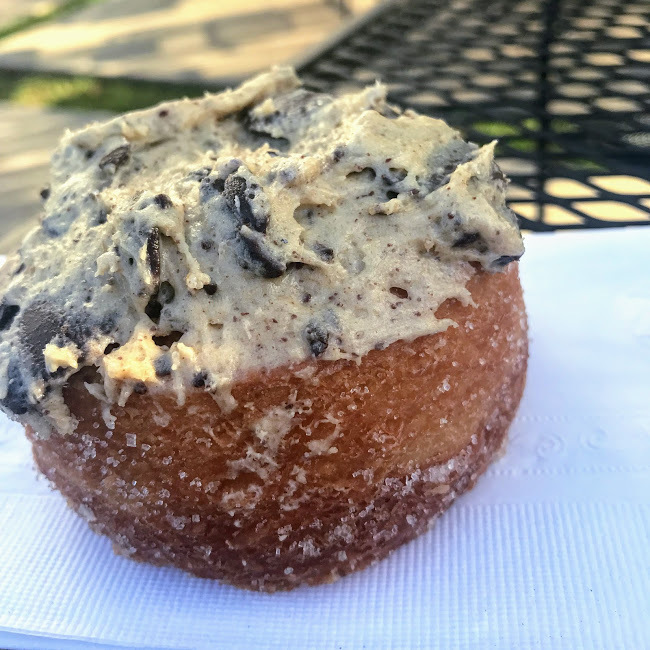 I didn’t count them, but did conclude that putting a smear of cookie dough on top of any donut is a brilliant idea. 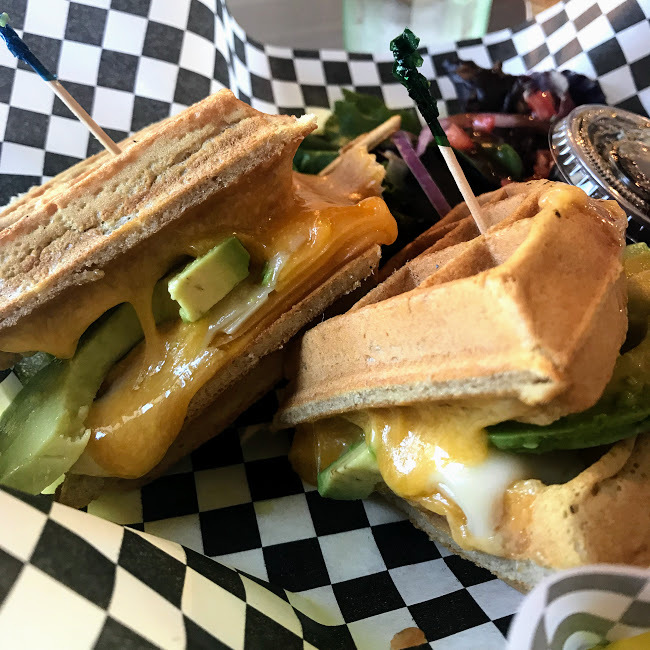 In that same category of hybrid indulgences was the waffle grilled cheese at The Terminal Café (I’m hopeful that Chicago will catch up to this idea soon). 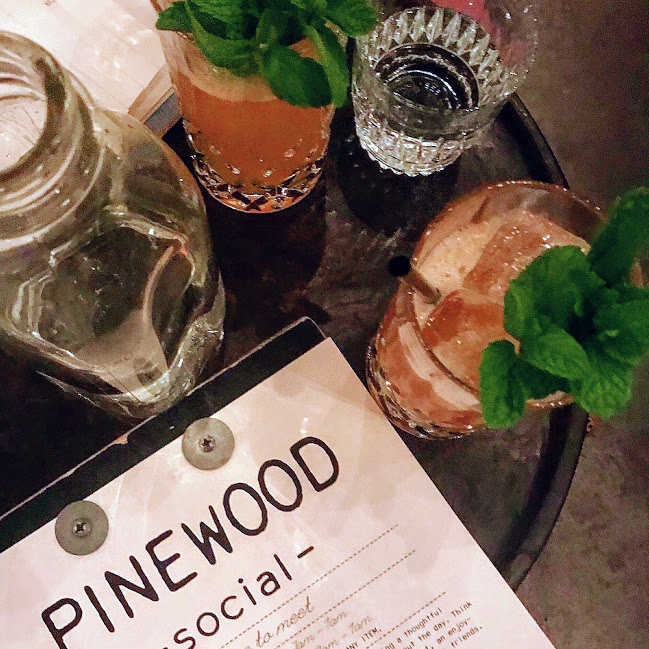 I was excited to briefly check out Pinewood Social, an airy all-day venue with novelties such as bowling lines and a pool. While we didn’t stay for those activities, it was still worth it to sip this cocktail, a julep variation with added depth from amaro and ginger. 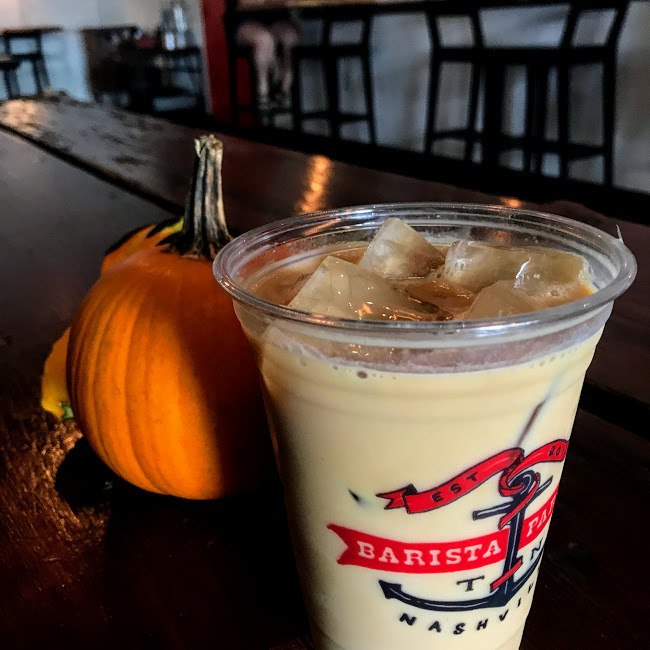 It was warm enough to still crave caffeine over ice, so I found two delicious versions: the iced bourbon vanilla latte at Barista Parlor, a gorgeous converted garage space; and the salted maple pecan cold brew at The Trailer Perk, an adorable mobile shop parked inside the Nashville Farmers Market. 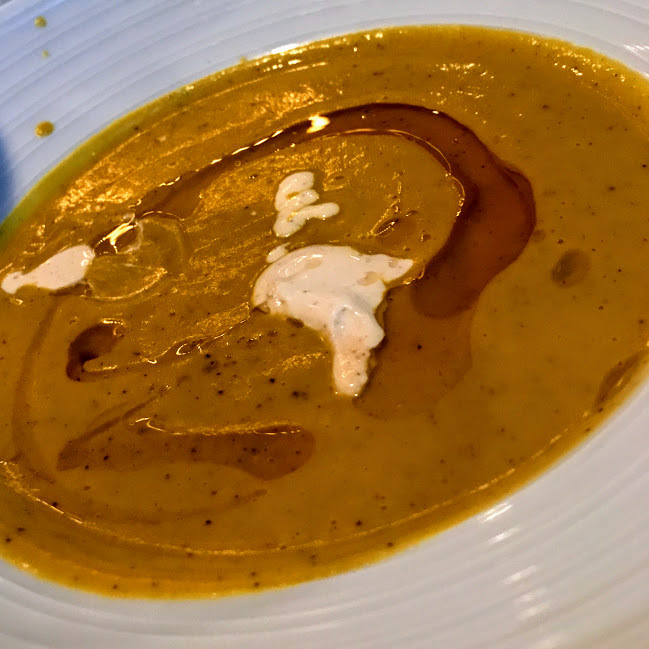 One last trend worth mentioning was turmeric – the golden-hued powder is becoming increasingly popular for its health benefits, so it kept popping up everywhere we went. 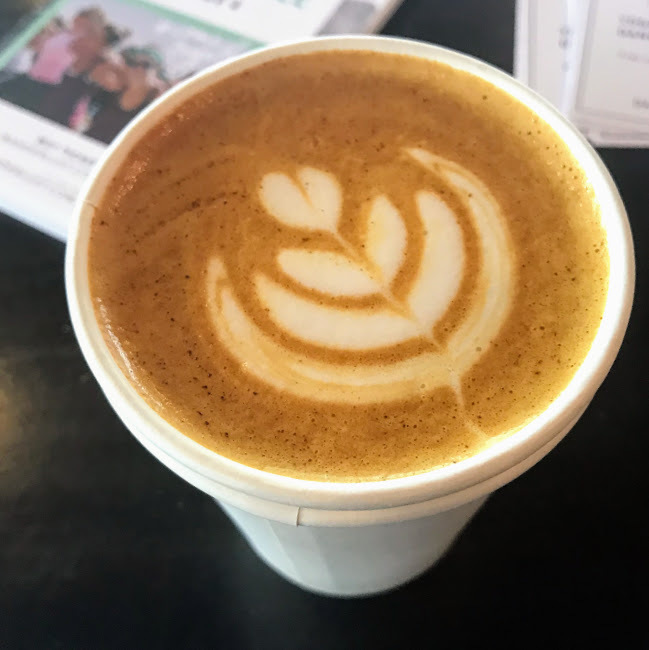 I tried it in a latte with other warm spices at Ugly Mugs, then in a cooler at Café Roze; both were flavorful and somehow cleansing. 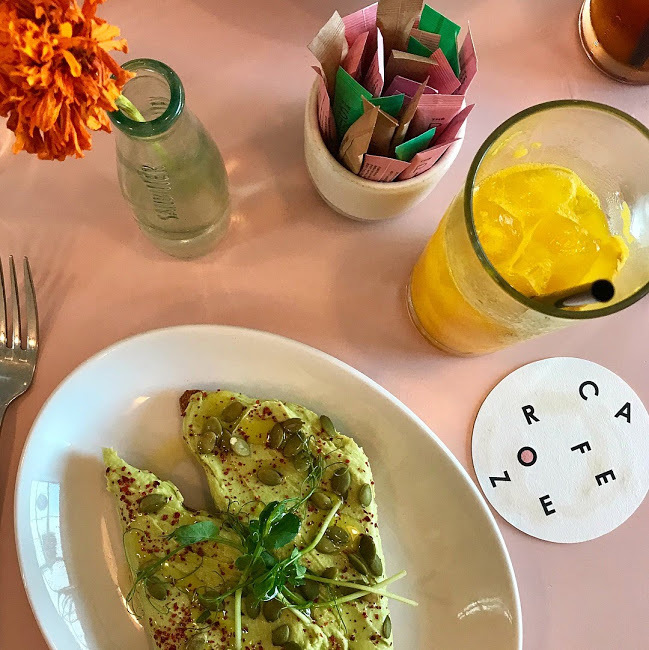 I have to say, too, that having that vibrant cooler alongside (really good) avocado toast, all on top of a millennial pink table, felt like the most Instagram-worthy moment of 2017. The details: Butcher & Bee, 902 Main St.; Husk Nashville, 37 Rutledge St.; The Terminal Cafe, 733 Porter Rd. 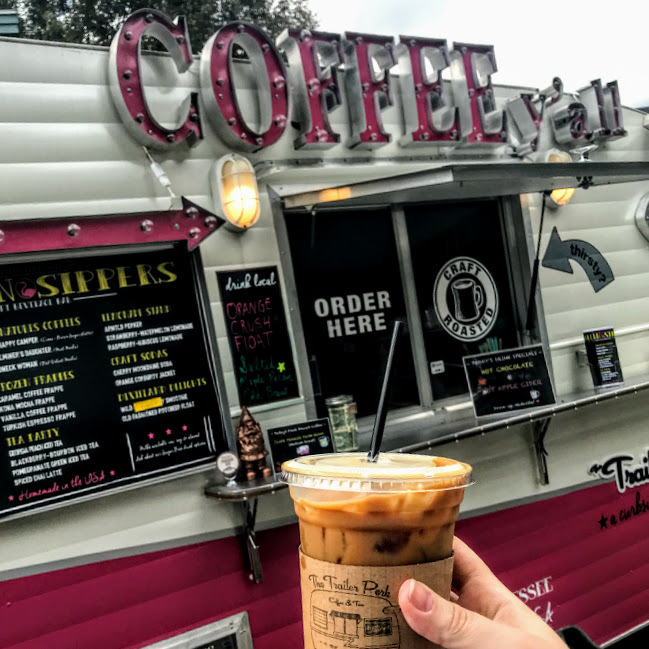 ; Five Daughters Bakery, 1900 Eastland Ave.; Pinewood Social, 33 Peabody St.; Barista Parlor, 519B Gallatin Ave.; Ugly Mugs, 1886 Eastland Ave.; The Trailer Perk at Nashville Farmers’ Market, 900 Rosa L. Parks Blvd. ; Arnold’s Country Kitchen, 605 8th Ave S.; Cafe Roze. In the midst of a week of celebratory Las Vegas dining, I knew that I wanted dinner on my actual birthday to feel extra special. 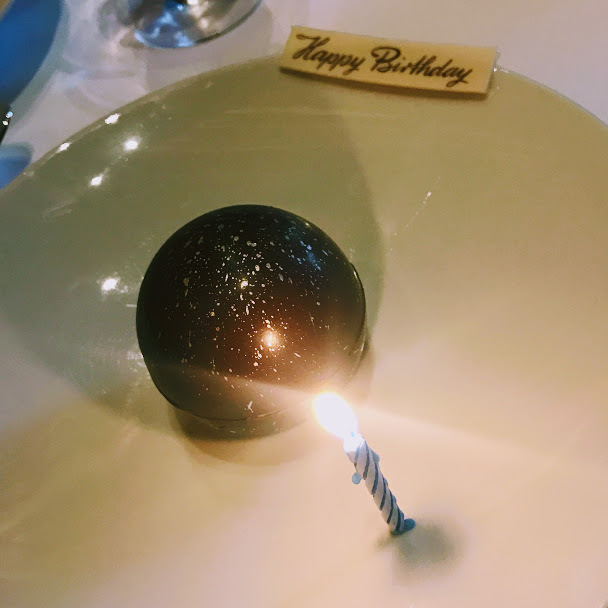 I’d always heard about Le Cirque’s legacy in New York over the decades, and it just felt right to go classic French for this milestone birthday. I’m happy to report that from the moment we walked into the restaurant, our party was treated in a way that befit such a special occasion. 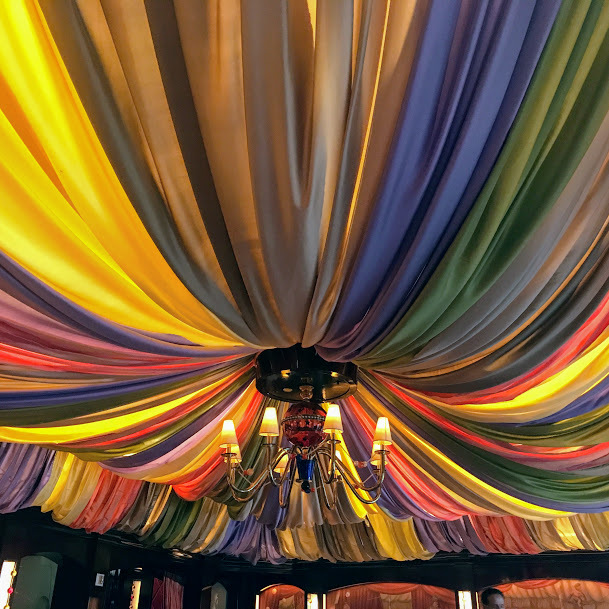 The whimsical and strikingly colorful “circus tent” ceiling set an appropriately celebratory tone, and the window beside our table afforded a view of the famous Bellagio fountains, making the whole thing just a bit more magical. 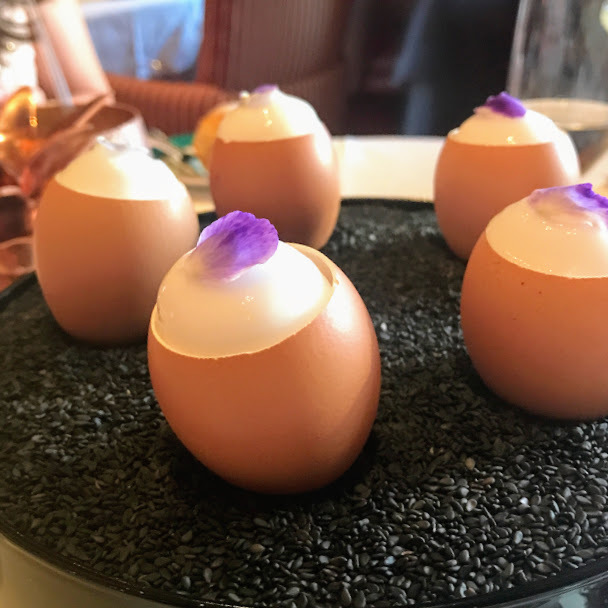 The whimsy continued with the amuse-bouche: a hollowed-out egg was refilled with lemon mousse and a dollop of carrot mousse, both tinted and shaped to resemble the egg’s original contents. It was a delightful way to start the meal. I ordered the escargots as my appetizer, and was pleased to see that Le Cirque’s version went far beyond the typical garlic butter bath. 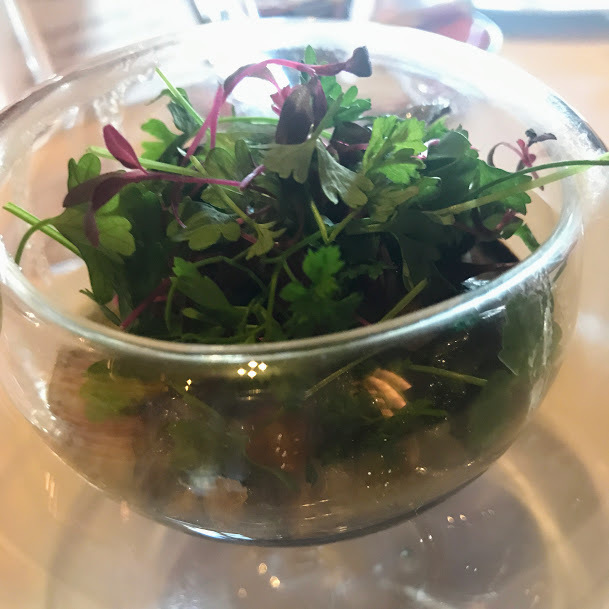 The bowl was filled with so many textures: tomato confit, crispy croutons, tender greens; and, of course, lots of snails and butter for a hearty and aromatic dish. 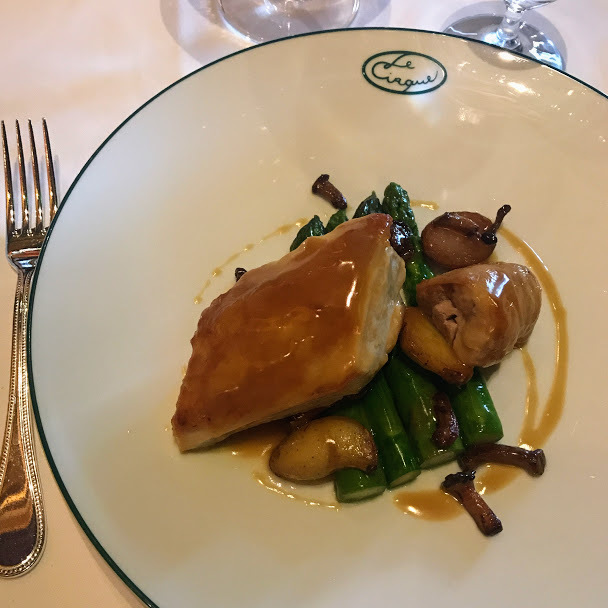 Thankfully, a dining companion ordered the foie gras starter instead, so I was more than happy to sample a few bites of one of my favorite foods. 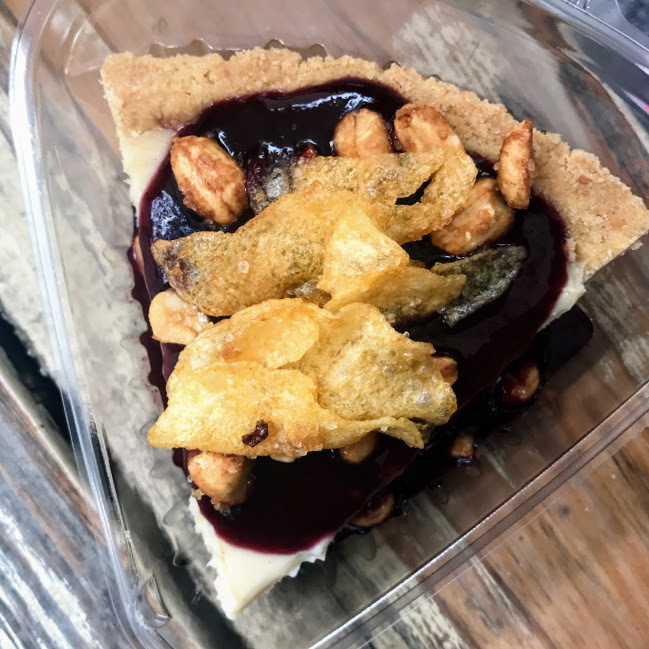 The crunchy texture of puffed rice and grains on top, together with the sweet floral sauce pooled underneath, made this version really stand out. For my entrée, I stayed classic with roast chicken, mushrooms, potatoes, and asparagus. 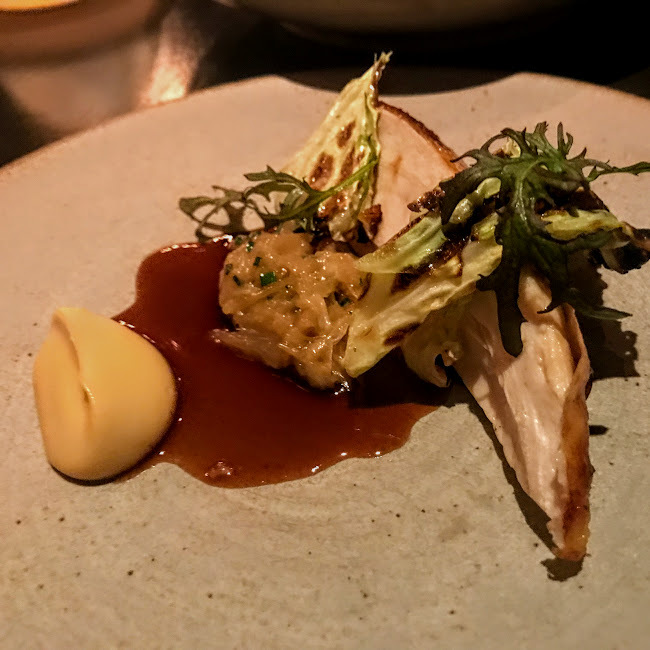 Everything was expertly executed – especially the near-silky chicken – and the foie gras sauce gave it another touch of luxury. 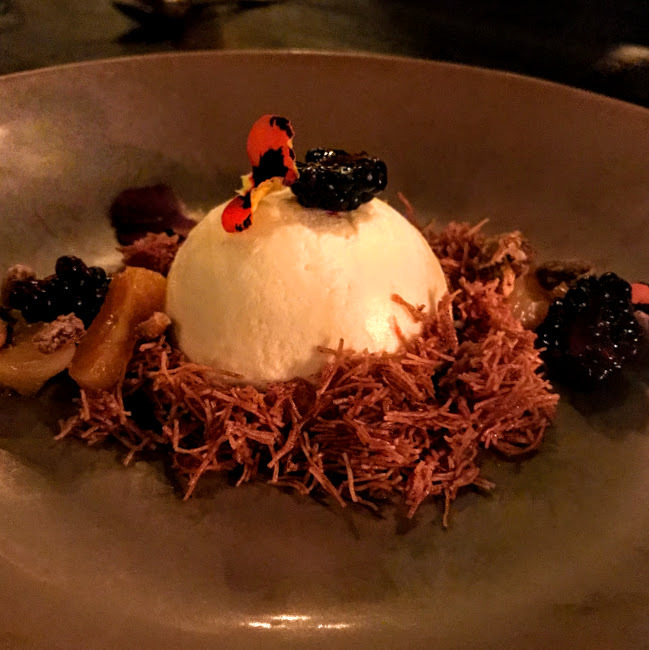 When it came time for dessert, I was given an option: either the chocolate ball that the rest of the table had ordered, or an off-menu soufflé. I couldn’t pass up the quintessential demonstration of culinary technique that is the soufflé, so I chose that. However, due to a mix-up in the kitchen, I ended up with both desserts! 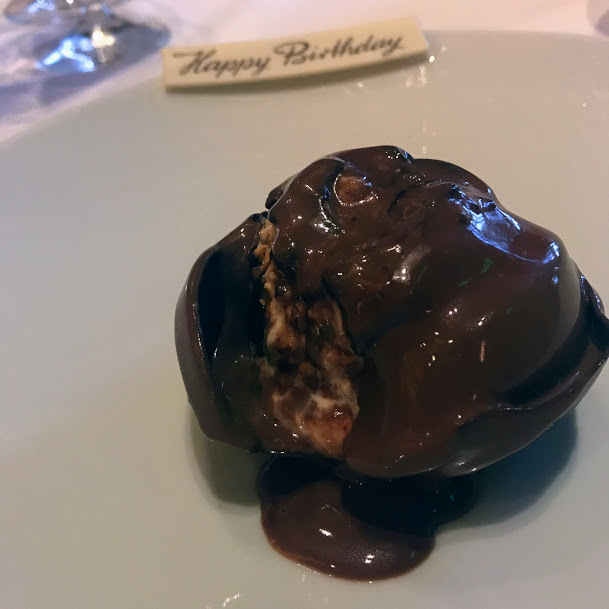 For the chocolate ball, melted chocolate was heated to a precise temperature and poured over the ice cream-filled ball, causing it to gradually crack in a way was completely mesmerizing. 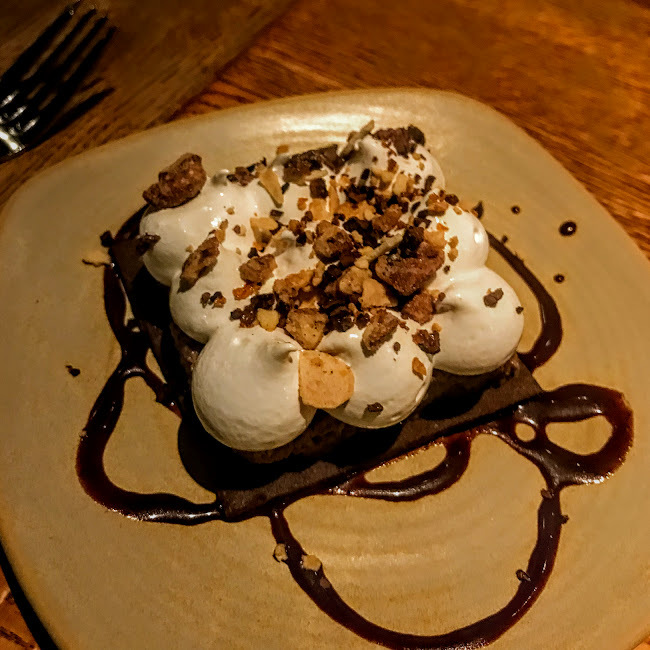 The hot-and-cold contrast with a bit of praline crunch was absolute chocolate paradise. 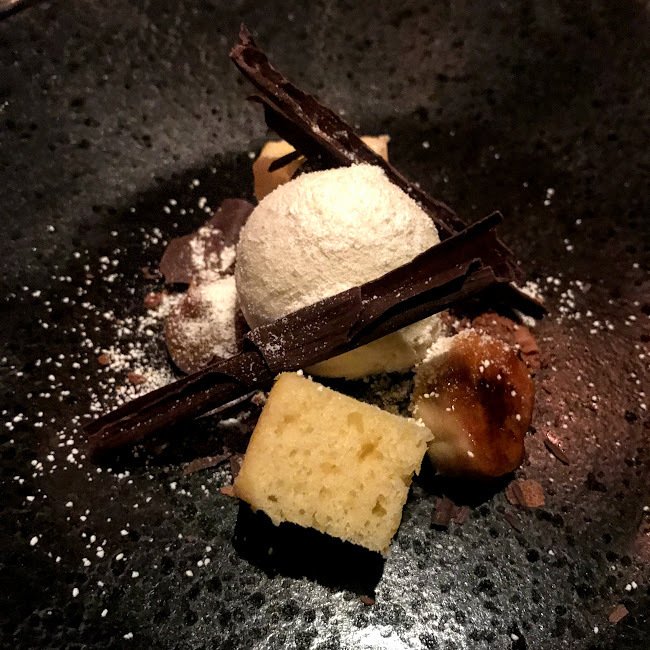 Then, the sky-high chocolate soufflé arrived, and again I was transfixed by the skill of the pastry chefs. 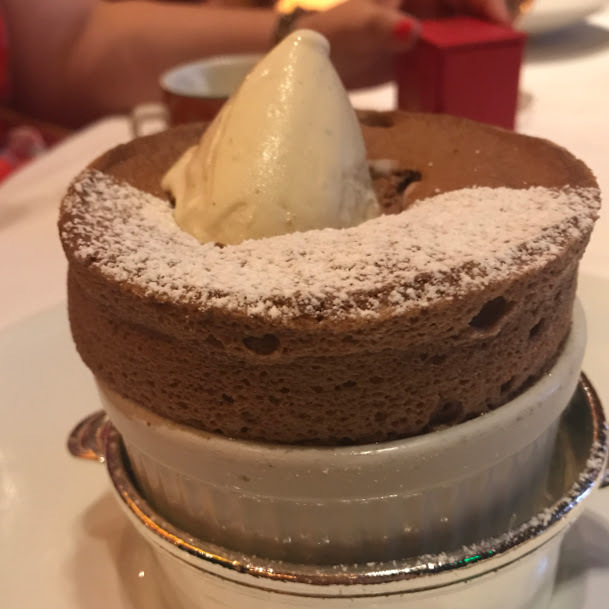 There are so many things that can go wrong with a soufflé, and even the best ones can still fall quickly, so tasting its airy, chocolate-y magic bite after bite left a lasting impression. 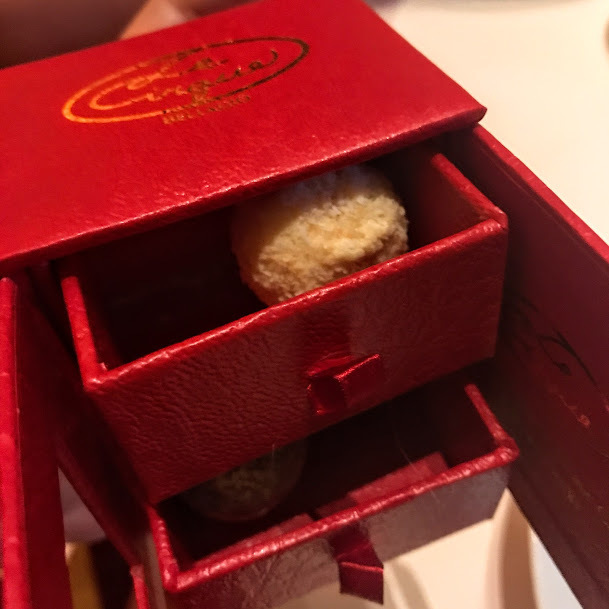 We were each sent on our way with a red leather box that had a housemade truffle tucked inside each of its two drawers. Weeks later, one glance at the box and my mind is right back to re-living this extraordinary meal. The details: Le Cirque at Bellagio, 3600 S. Las Vegas Blvd., Las Vegas.